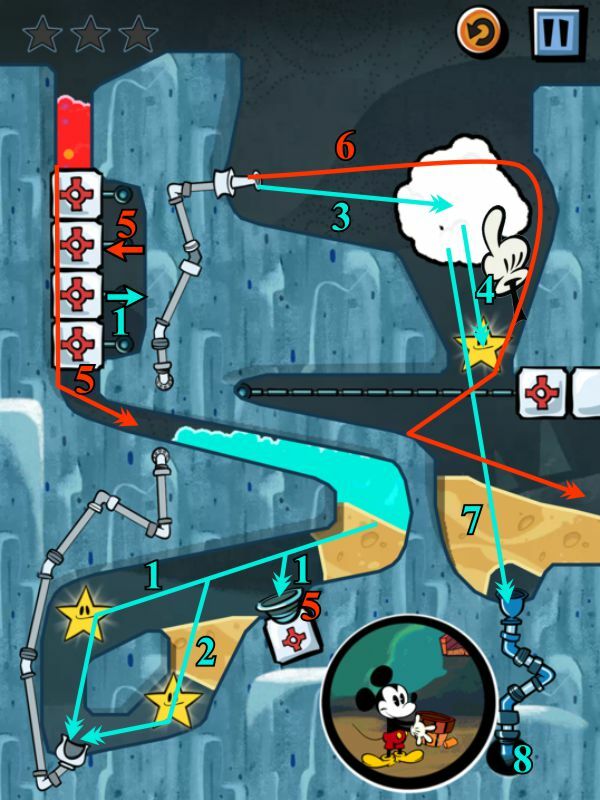 Each level in Where's My Mickey? 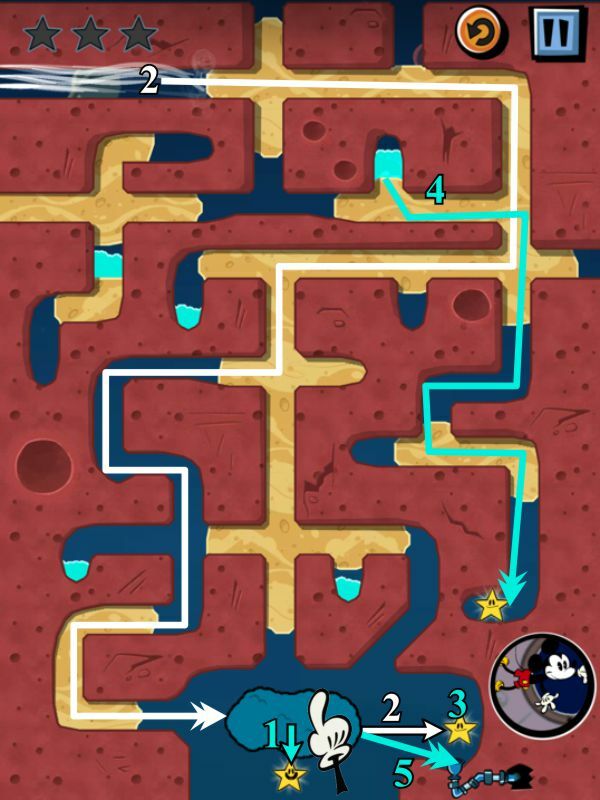 presents you with a maze of pipes, drains and soil. 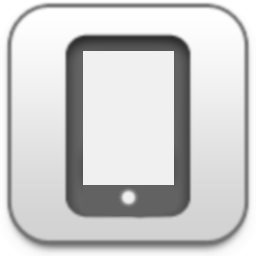 Much of the dirt can be removed by swiping your finger to draw paths. 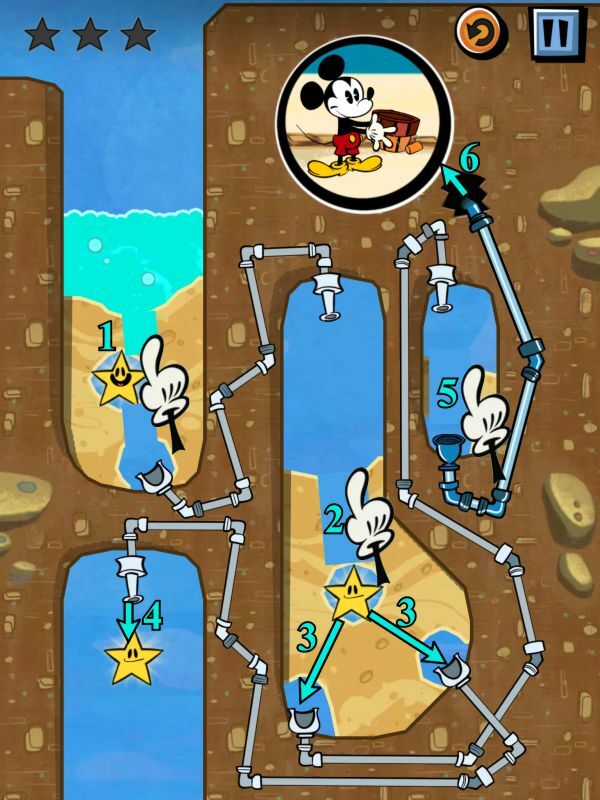 Make trails to funnel the water to the appropriate drains, collecting stars and turning switches along the way. New to the franchise are sponge-like clouds that store and release water. Use gusts of wind to move these clouds around so you can make it rain right where you need it. Where's My Mickey? is a real animated adventure. Disney characters make cameo appearances left and right, and there's a host of animated cutscenes to keep things rolling right along. The art style is much more old school Disney rather than prim and polished modern Disney, which was a fantastic choice for Mickey's latest outing. There are over 100 levels to complete, along with some scattered bonus items to uncover that unlock bonus puzzles. It's hard to say no to more dirt-digging water collection. Where's My Mickey? 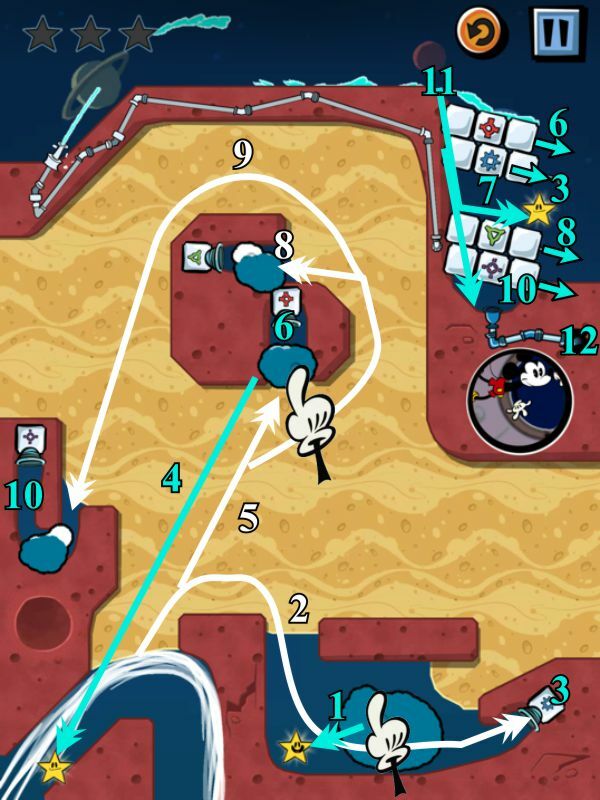 takes the familiar formula and adds just the right amount of newness, making it a creative and challenging puzzle game you'll be happy to play for hours on end! Where's My Mickey? Walkthrough now available! 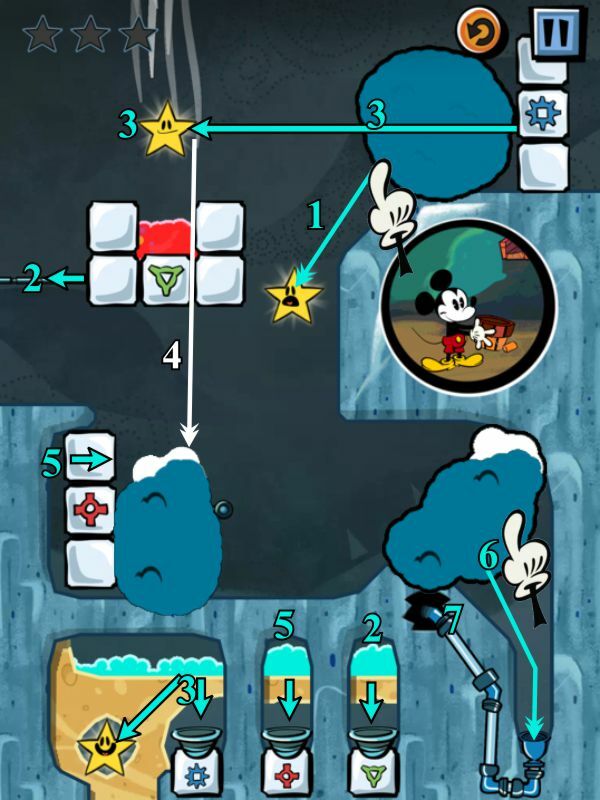 From the Main Menu, you can Play the game, select the gear to choose your settings, view other Disney games, and connect to Twitter or Facebook. 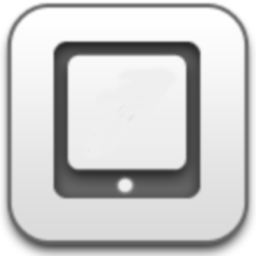 Settings include Music and Sound volume or mute, choose your language, restore purchases, view the credits, and reset the game. Slide your screen to the right for a sneak peek or to purchase the Goofy Episodes, watch the new Mickey Cartoons, or to purchase Where's My Water. When you press Play, you will have your choice of which Episode you wish to play. Selecting the Bone in the lower left corner gives you access to Pluto's Collectibles, and the Trophy in the lower right brings up your Achievements. In the upper left corner of your screen are your stars, but when you see a question mark next to them, there will be a hidden item for you to uncover on that level. 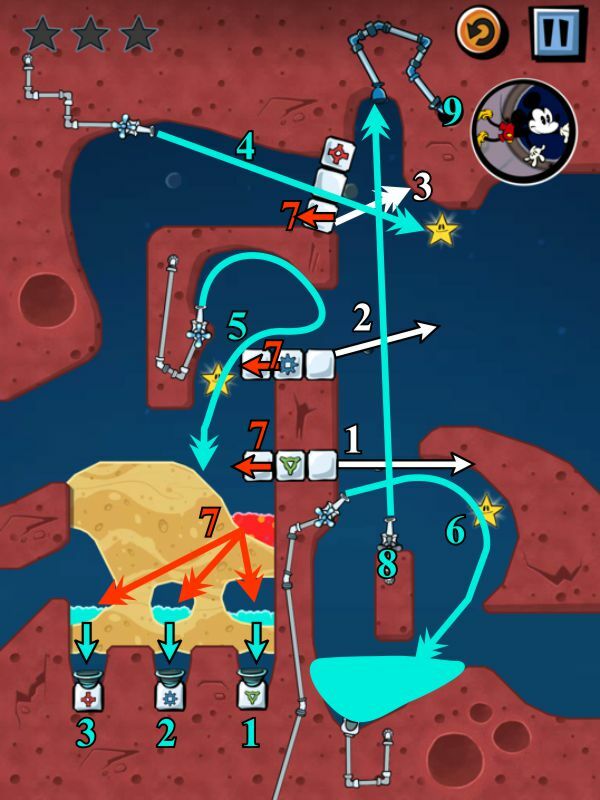 Check the screenshots for each level and follow the numbers and arrows for the 3-star solution. When Life Gives You Lemons: Complete all levels of Episode 1. Make Lemonade: Collect all 60 stars in Episode 1. Fanning the Flames: Complete all levels of Episode 2. Full Burn: Collect all 60 stars in Episode 1. Growing Pains: Complete all levels of Episode 3. All Grown Up: Collect all 60 stars in Episode 3. How'd That Get There? 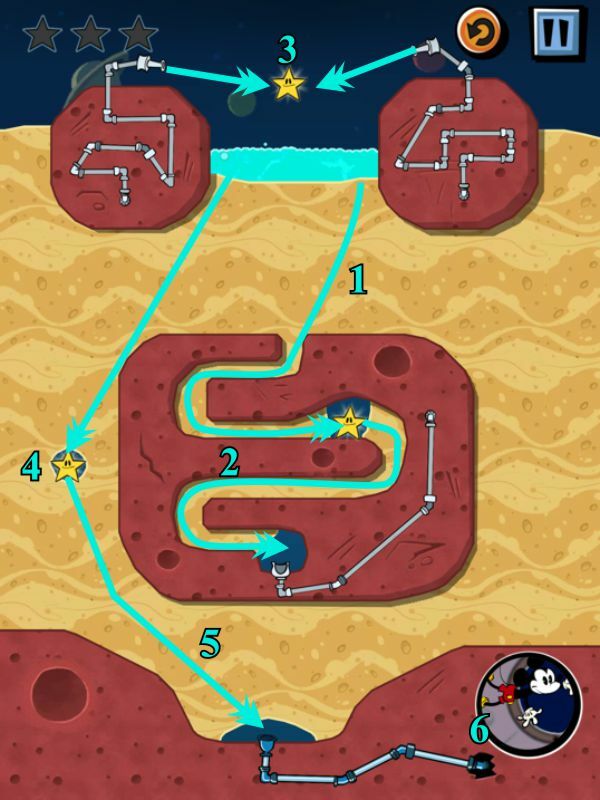 : Find a buried item in a level. Treasure Hunter: Find 10 buried items. Bonus Time: Find enough buried items to unlock a bonus level. 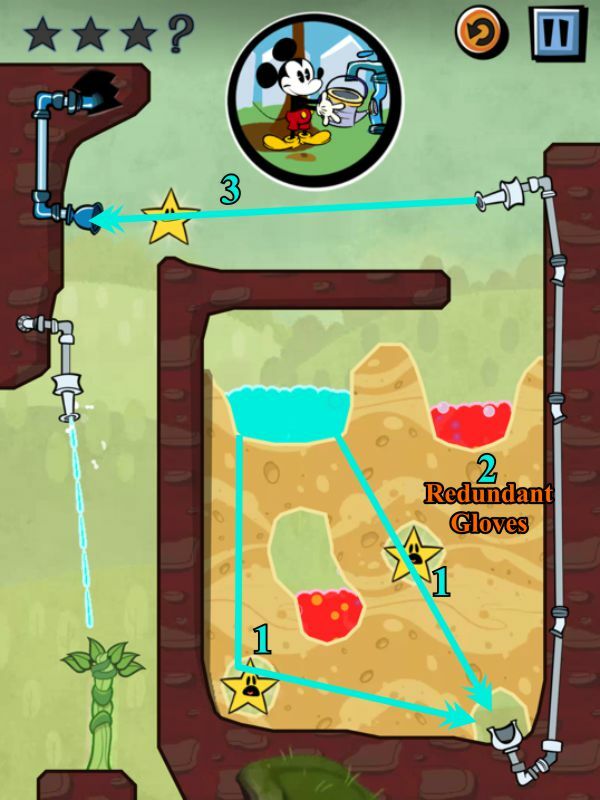 Water Wise: Beat a level with exactly 20 drops of water. Surprise! : Surprise Mickey with Red Fizzle 20 times. Efficient Cut: Cut with 2 fingers at once in a level. Not a Quitter: Retry the same level 8 times. 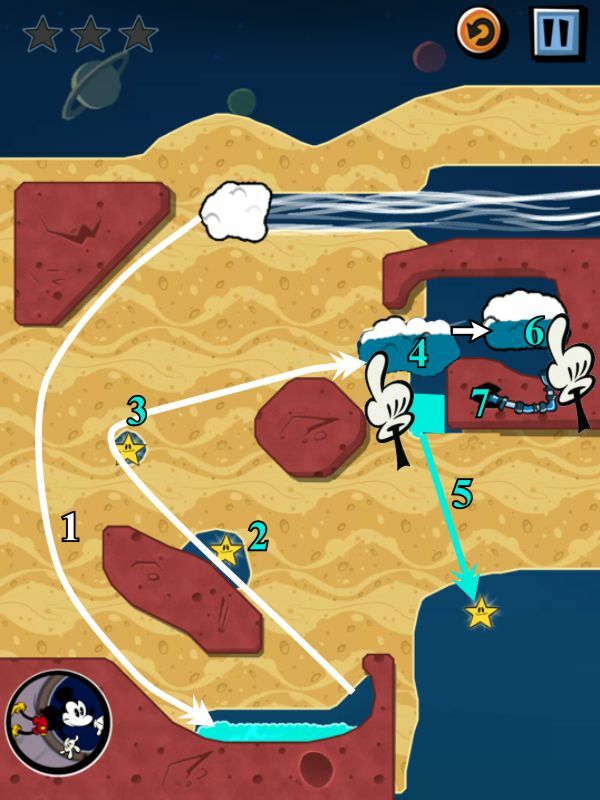 Fizzle Out: Completely destroy all clouds in a level using Red Fizzle. Switched Off: Destroy 20 switches with Red Fizzle. Clearing: Kill 50 plants with Red Fizzle. Green Thumbs: Grow 50 plants to full height. Water U Doing: Surprise Goofy with water 20 times. Hot Soup: Convert water to Fizzle using Fizzle Weeds 50 times. Sandbox: Play in the Van Goofy sandbox. Daily Dose: Return to the game for 3 consecutive days. Speed Demon: Complete an entire episode in less than 1 hour. 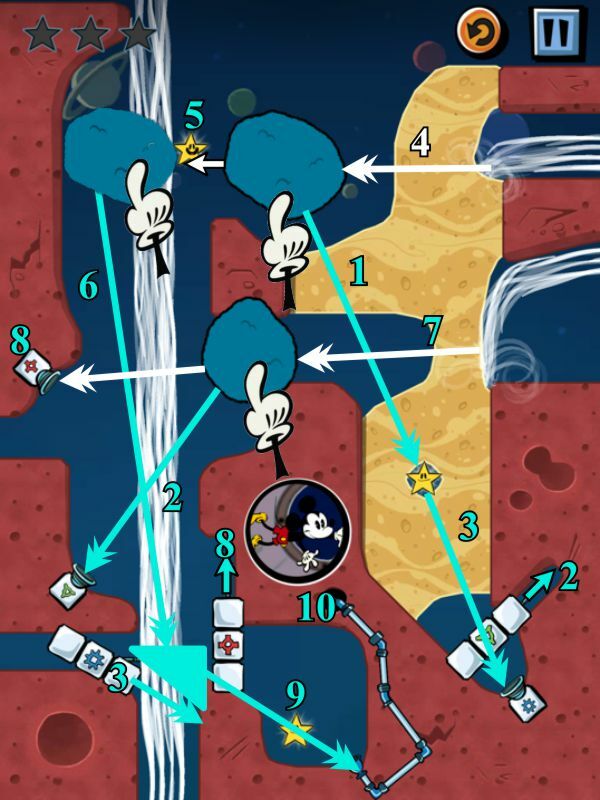 Cleanliness: Dig away every single bit of dirt in a level while solving it. Notified: Launch the game in response to a push notification. Not a Drop: Lose all the water in the level 20 times. 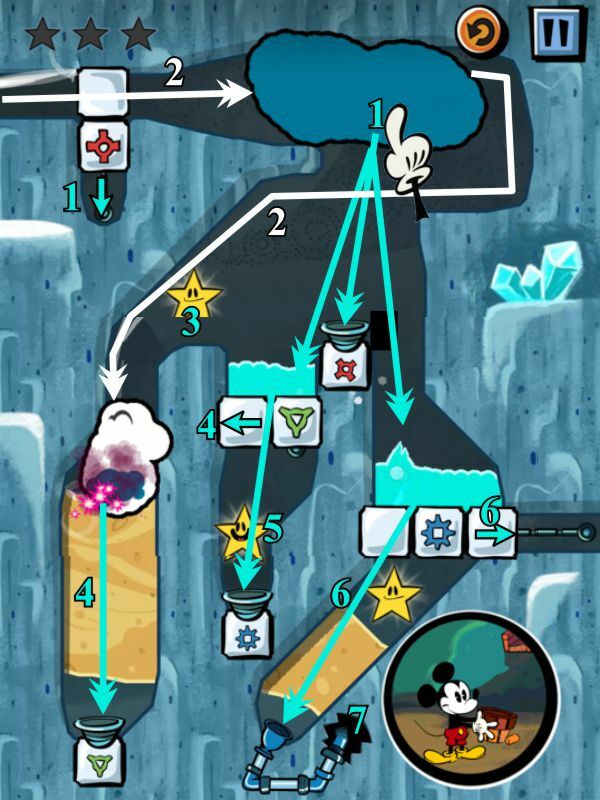 NB: Check the screenshots for each level and follow the numbers and arrows for the 3-star solution. Move your finger down through the sand so the water will capture the stars and get to Mickey. 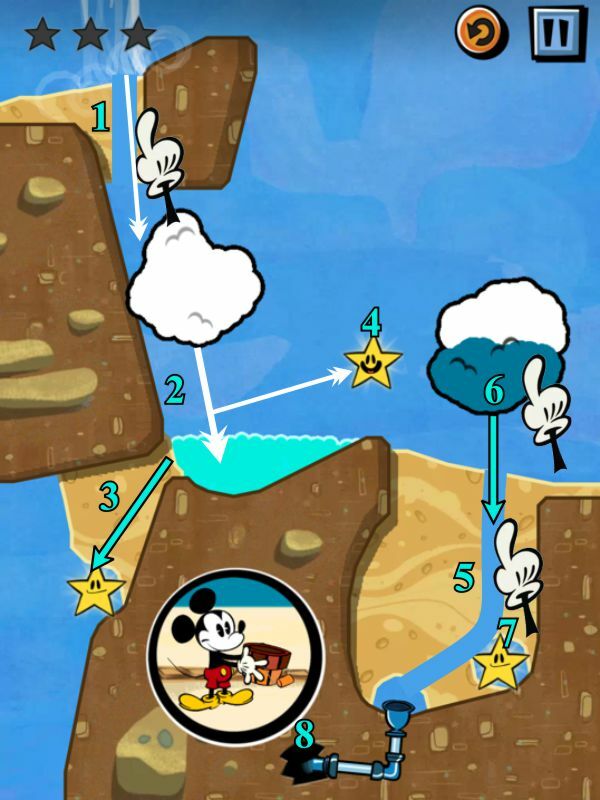 Part the sand as shown in the screenshot, and tap the cloud to rain over each star and funnel down to Mickey. Part the sand to capture the first star. Make a path for the second star. Widen the path so the water will reach the next funnels. The one set of pipes will get your third star. 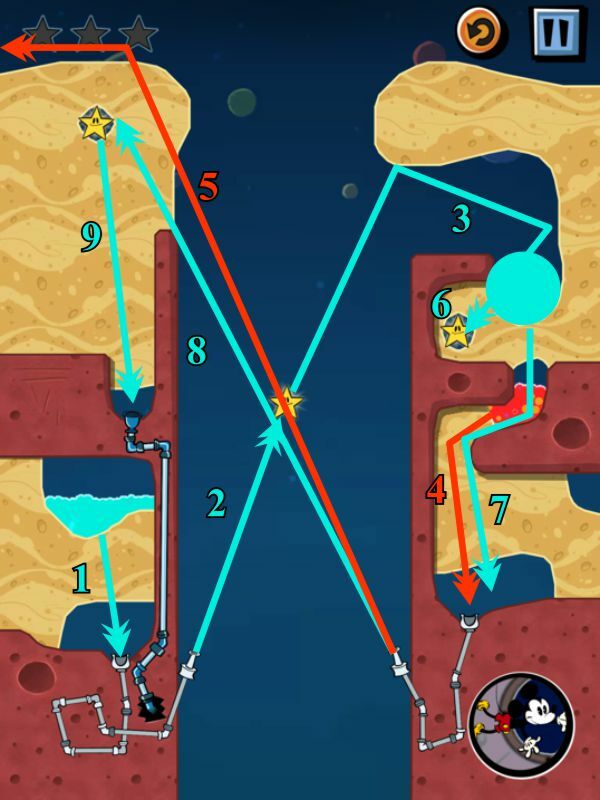 In order for the water to get to the last pipe, you need to make a path. The water can now shoot down and up to Mickey. Make a skinny path to get the first star. Widen the bath to reach the first pipe. The water will shoot up to the star and fill the cloud. Make a path in the right indentation and be sure to get the Ball. 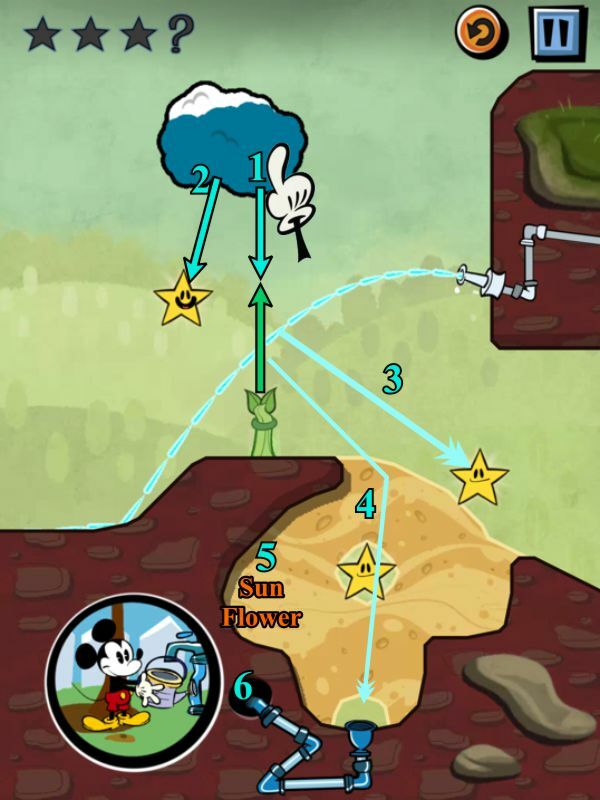 Tap the cloud to get the star and send water to the funnel. Make certain there is no sand covering the outlet so the water can get to Mickey. Make a path for the rain to get to the first two stars. Tap the cloud to remove the stars. The water will funnel into the area marked with a cross so the chain will pull the blocks to the left. 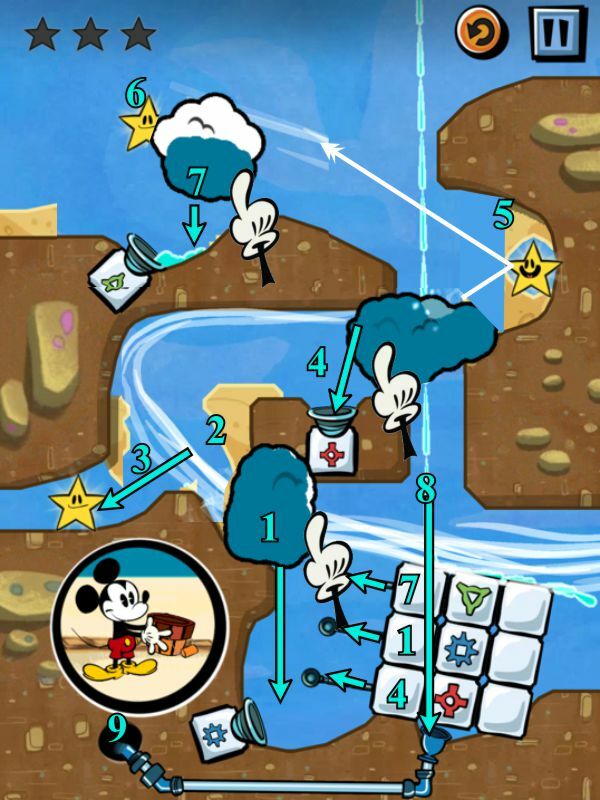 Tap the cloud to get the last star and the water to Mickey. 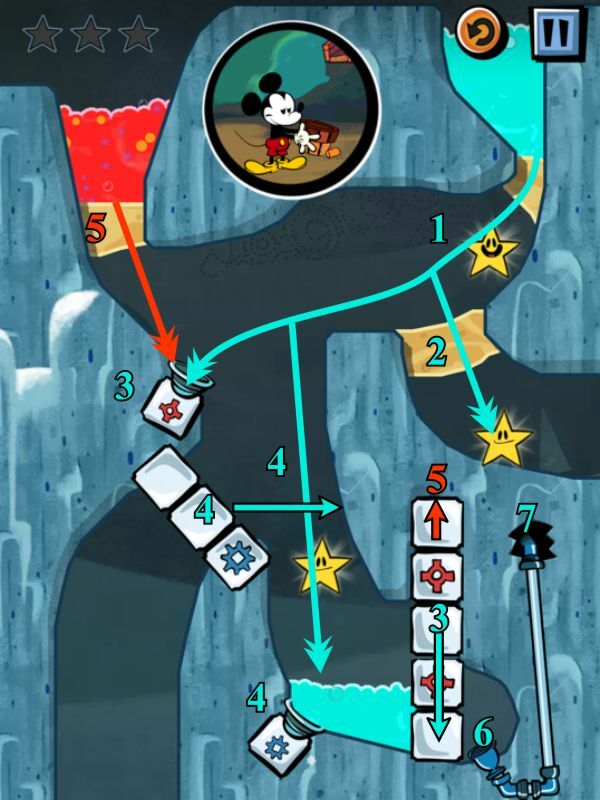 Use 2 fingers to make a path to the two stars, and you will get an achievement. Carefully continue a skinny path to the star in the horseshoe shape so the water will bubble up and get it. 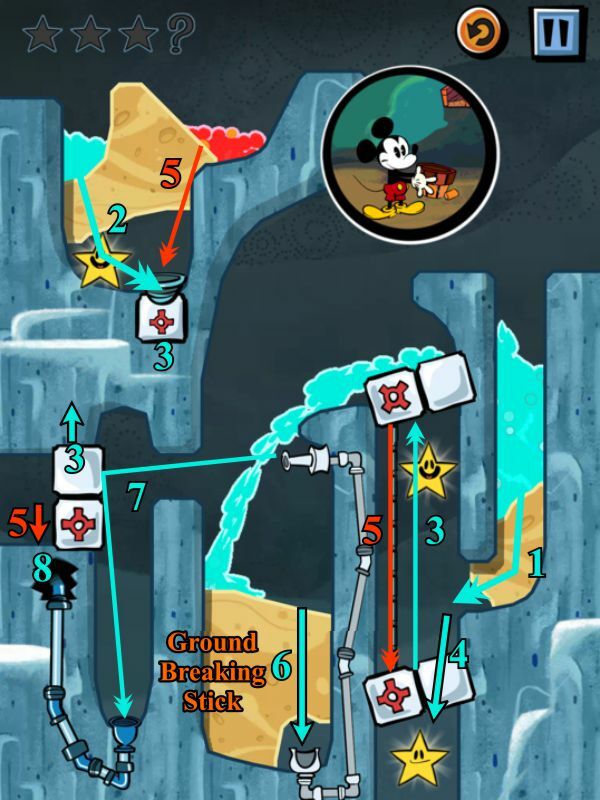 The block should have moved out of the way so widen you path to find the Bucket and get the water down to the funnel so reach Mickey. 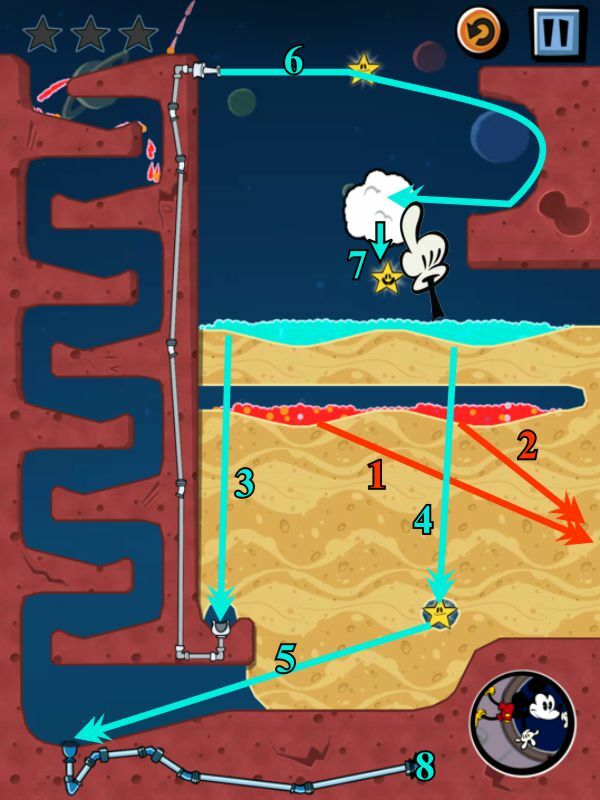 Make a path as shown so the water will hit all the stars when you tap on the cloud. 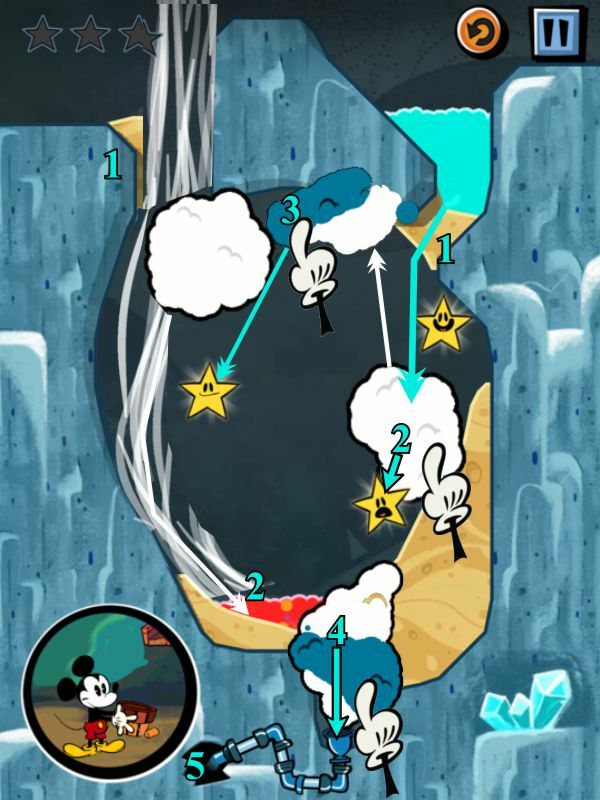 Keep tapping the cloud until there is sufficient water to get to Mickey. The wind will move the cloud, so quickly make a path to the nozzle and it will fill the cloud. As the cloud moves, it will catch the first star. Make a careful path that will catch the other stars when you tap on the cloud. 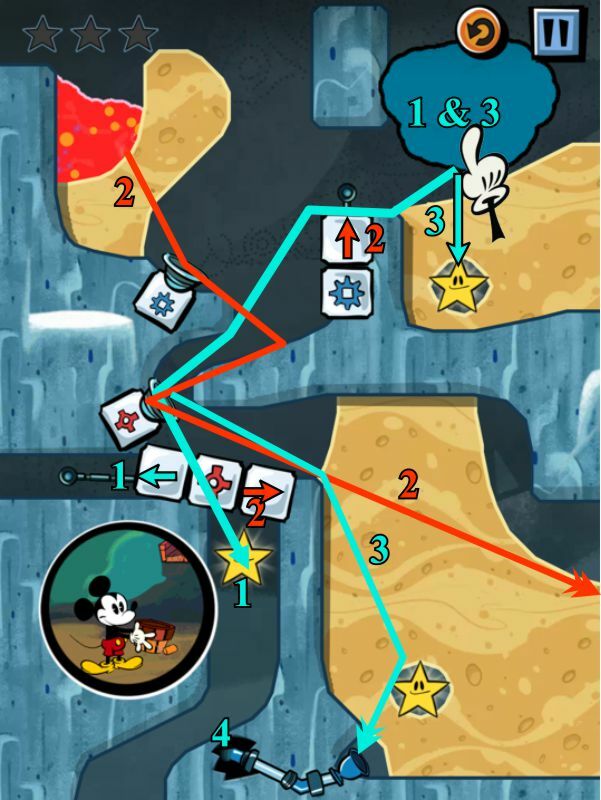 Extend the path to the pipe that goes to Mickey and keep tapping on the cloud. 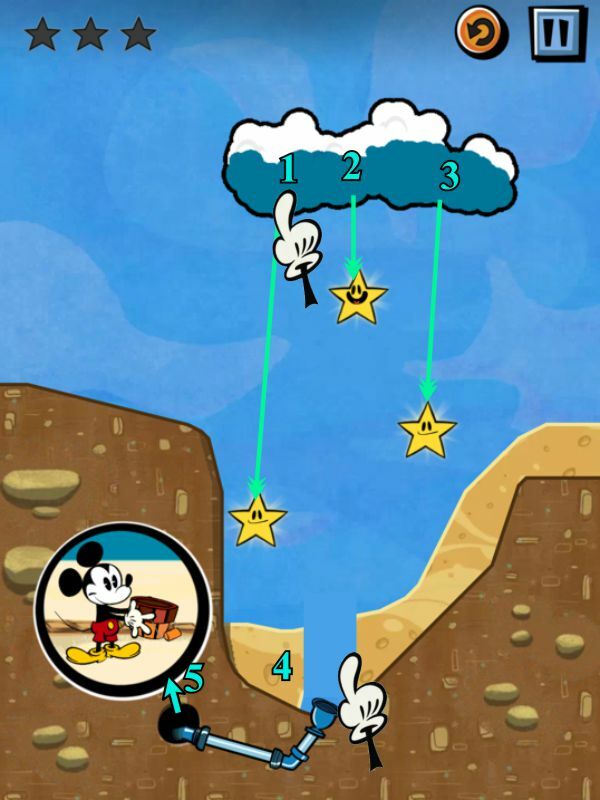 Make a path in the bottom sand and tap on the cloud to get the first star. Open the sand above so the wind can get to the cloud to move it over. 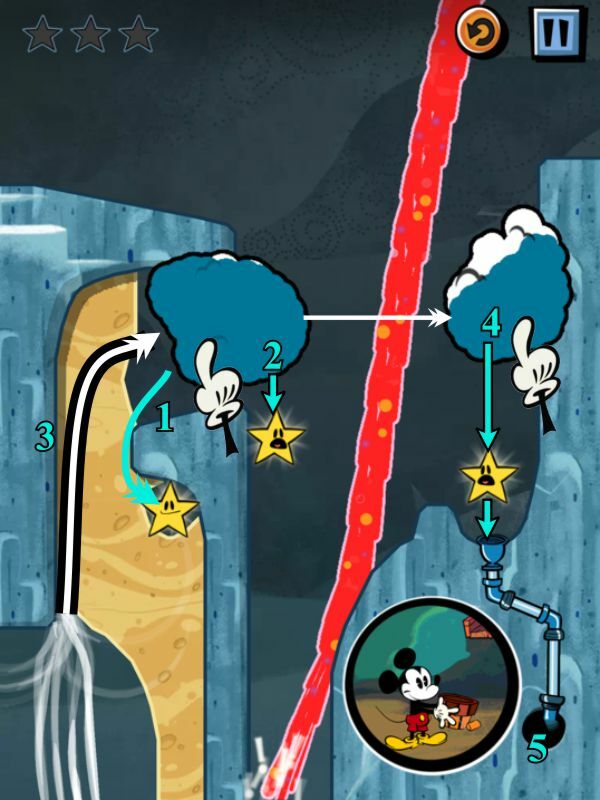 The nozzle will shoot the upper star, so tap the cloud to get the last star and send sufficient water to the funnel to get to Mickey. 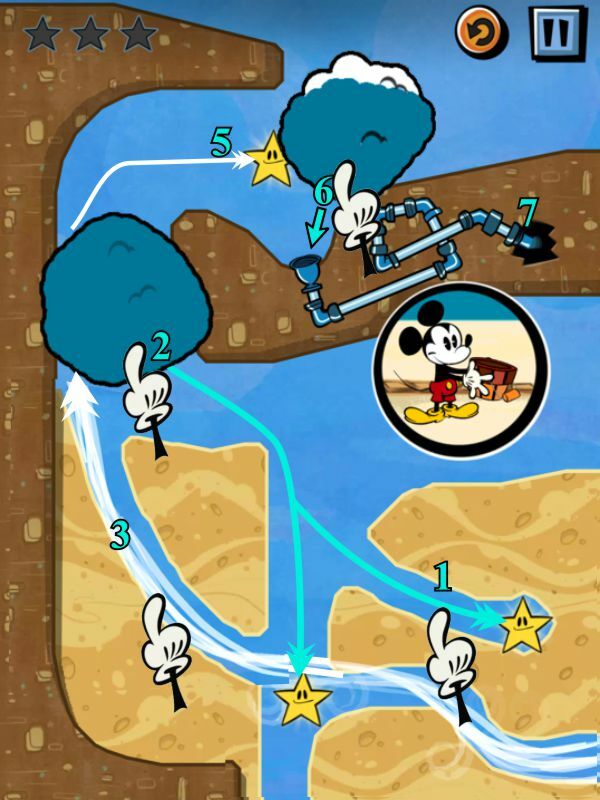 Very quickly swipe a path from the water as well as the lower sand above Mickey. The water will fill the cloud as it blows past and also go into the nozzle pipe. The nozzle will shoot the right star and the cloud will get the star in its path. Make a path to allow the water to hit the last star when you tap on the cloud. Widen the path to the funnel sufficiently so you can fund the Sunglasses. 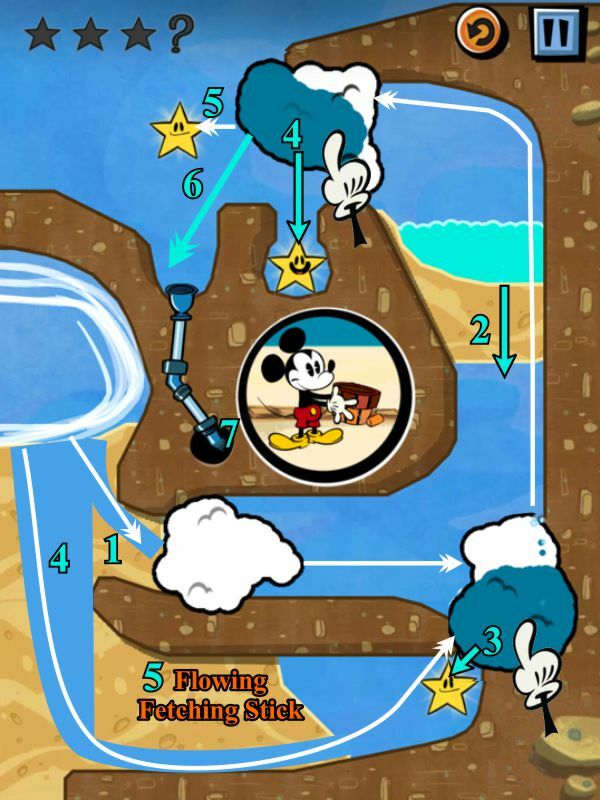 Tap on the cloud to send the rest of the water to Mickey. 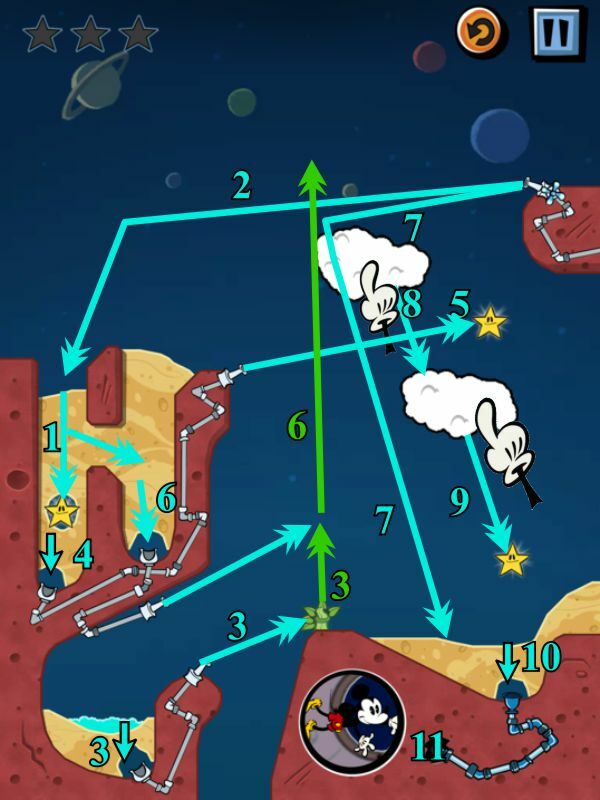 Make a path to the first star and tap the cloud to hit both available stars. Make a path to allow the wind to carry the cloud past the third star. 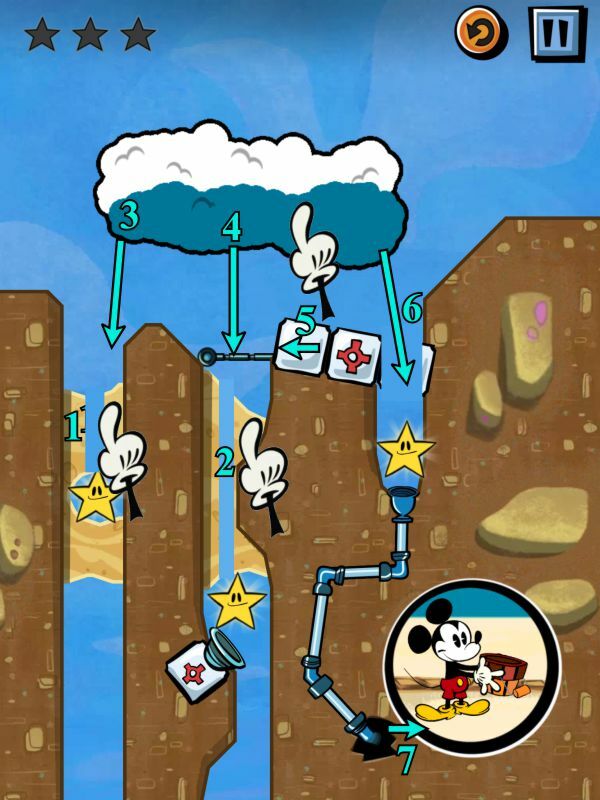 Tap on the cloud to get the water in the funnel to Mickey. 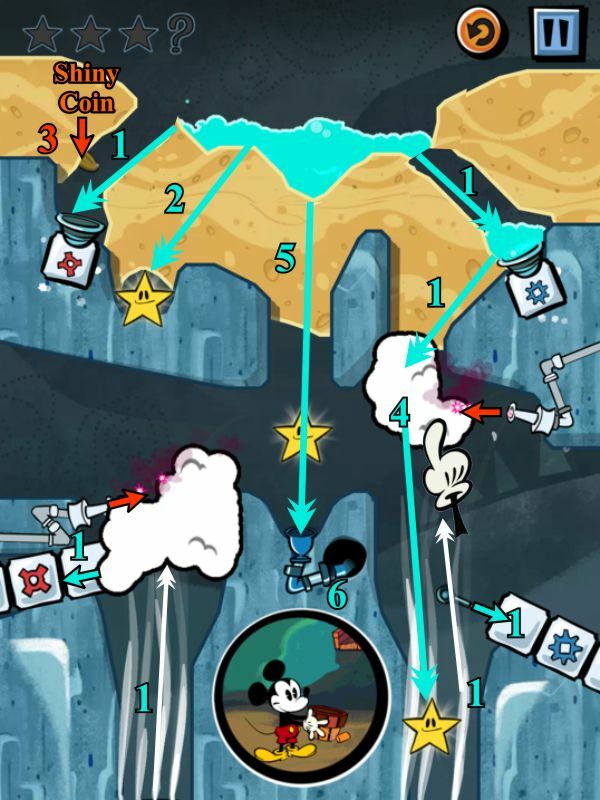 Tap on the cloud to get the first star before you let the wind blow the cloud over to the funnel to open the gate. Open the sand to send the water down to the other cloud. Make a small opening to catch the star at the left with water from the cloud. Open a bigger path for the wind to carry the cloud across to hit the star and funnel so the gate will open. Send water from the cloud down to the funnel for Mickey. Open the path to the 2 stars and widen the area left of there to uncover the Snack Shack. At the same time, open the wind and the path to the nozzle. Some of the water will get to the cloud so you can send it to the last star before the cloud blows away. The rest of the water will go into the funnel to get to Mickey. Open a trickle of water to the star. Open the path for the wind and extend the path to the nozzle. Enough water should get to the cloud for you to catch the other 2 stars. The open the rest of the water so the nozzle will shoot into the funnel to get to Mickey. Swipe water to the 2 upper stars at the same time. Let sufficient water get to the nozzle so it will shoot into the funnel to open the gate. Get rid of enough sand to find the Squeekless Toy, and the rest of the water will go to the cloud. 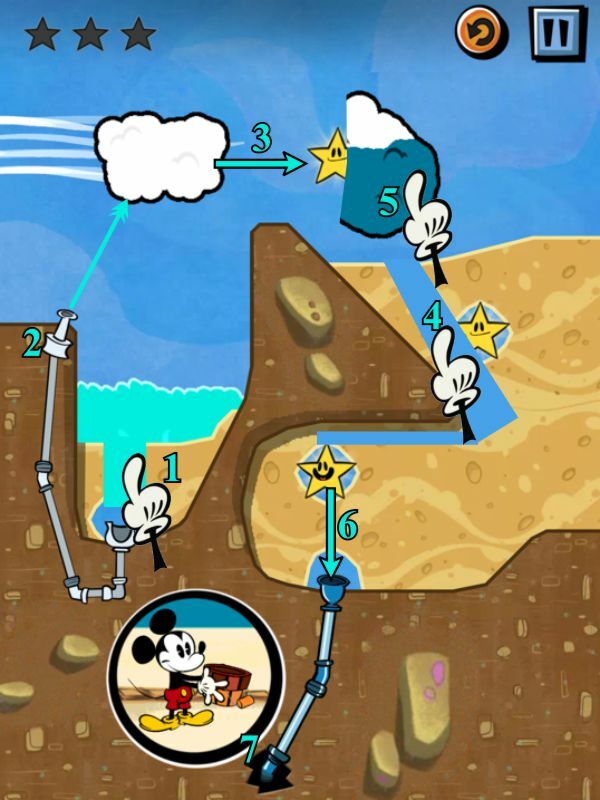 Send the water from the cloud to catch the star and fill Mickey's funnel. Make a path to send the wind to the cloud so it moves down to the water and soaks it up. Send some of the water to catch the left star before the cloud takes off to the right. The cloud will pick of the star in its path, so make a tunnel down by the star to the funnel. 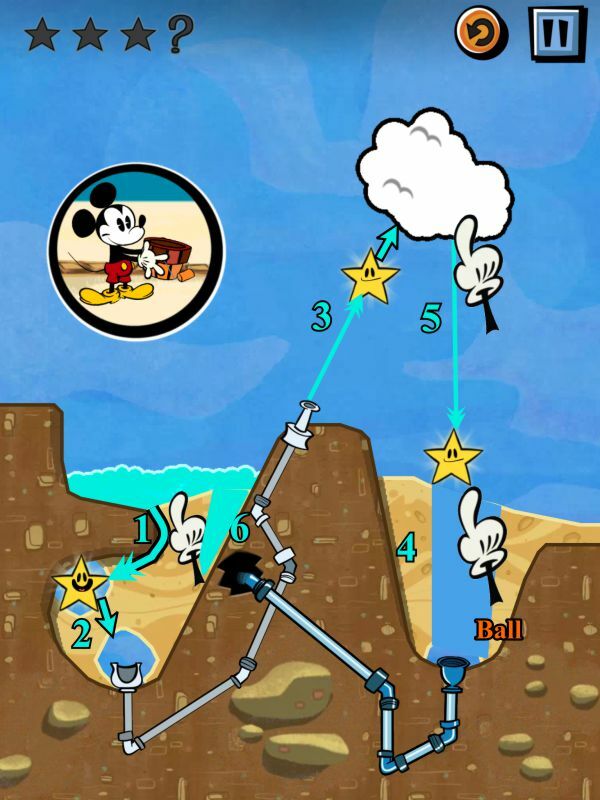 Tap on the cloud to catch the star and send the water to Mickey. Send some wind to move the cloud to the right. Part the sand to let the water hit the cloud. Tap on the cloud to catch the star. Make a path to send the wind to the bottom of the scene so the cloud will move upward. Once it starts moving, widen the path to find the Floating Fishing Stick. When the cloud gets to the top, send water to get the star in the crevice. The cloud will keep moving and catch the other star for you. Send the rest of the water down the funnel to Mickey. 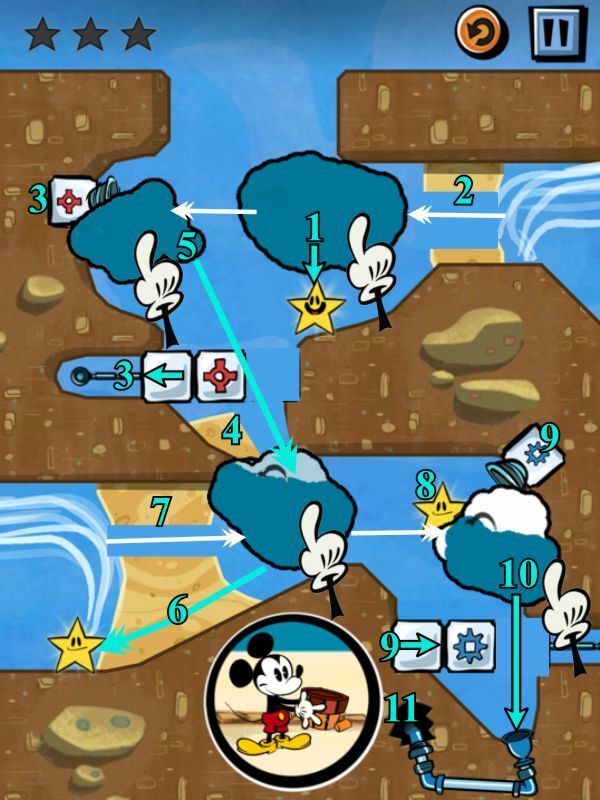 At the same time, swipe a path to get the water to the cloud and 2 stars. Open the wind, and the cloud will soak up the water and travel up past the other star. Tap on the cloud to open the gate. Once the gate opens, the water will flow down into the funnel and on to Mickey. Tap on the cloud to open the first gate. Open the path for the wind and then to the star. While the cloud passes by the star and the funnel for the second gate, send water to them. Clear the area by the right star and the cloud will capture it and continue to the next star. Send water to the funnel to open the last gate. The water streaming from above will hit the funnel that goes to Mickey. 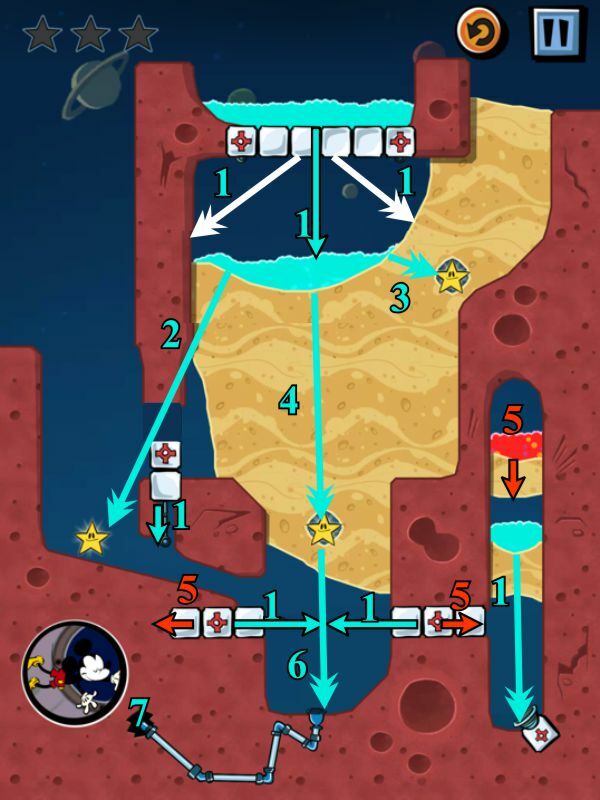 You have no control over the water spiraling down, so make enough of a path to capture the top star before the water hits the funnel to open the first gate. Meanwhile, open the wind path so the cloud is in position to catch the water when the gate opens. Hopefully, the water in the tube will catch the star on its way down so you can concentrate on the other star and tap some water over to it. Once you've captured it, open the sand to the gate funnel. When the gate opens, send the cloud water down to Mickey's funnel. For this episode, you are dealing with both fire and water, so be careful because you do not want the fire to hit any of your stars nor Mickey. In some levels, you will need to watch carefully to avoid the flames so you can get your water to the appropriate places. 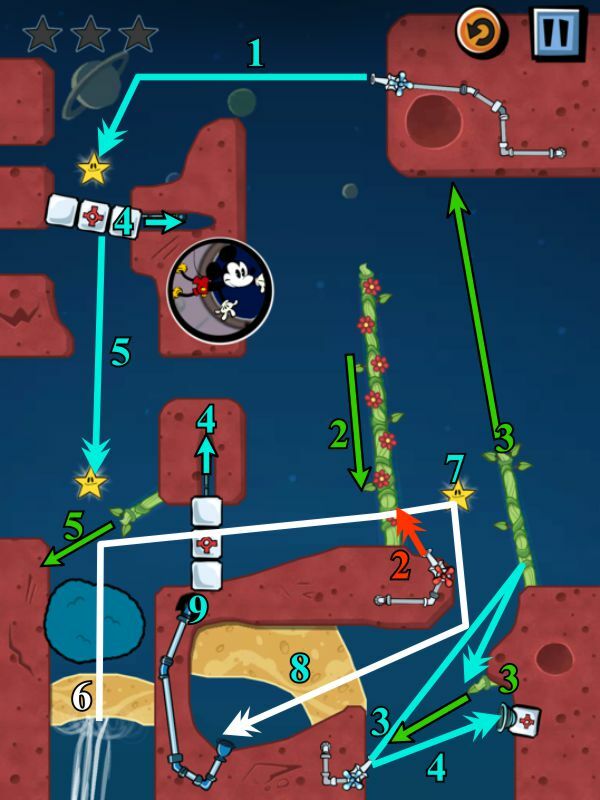 Remember to check the screenshots so you can follow the numbers and arrows for your 3-star solution. First off, let's get rid of the fire by making a path to send it off to the left. Make a path to catch you first star and tap the cloud. 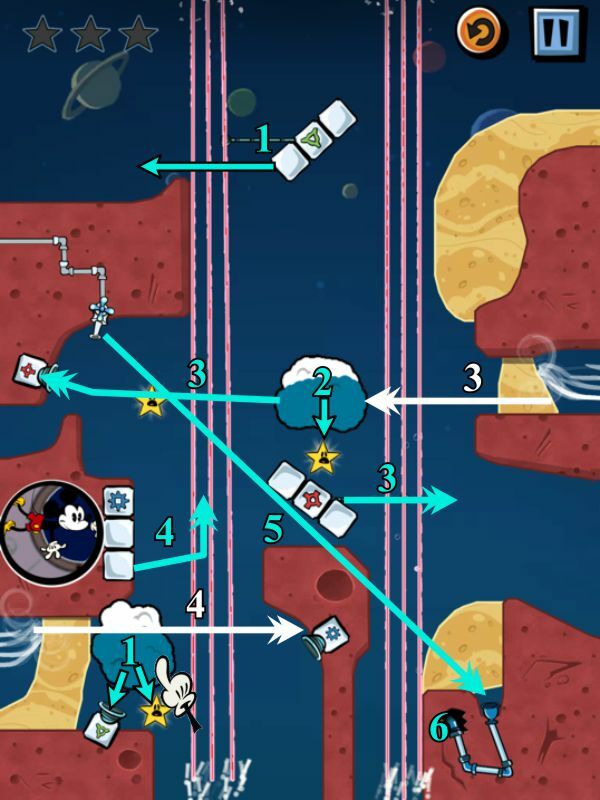 Make 2 paths at the same time for both other stars before you release the rain. 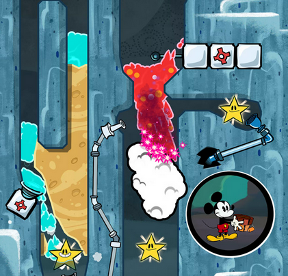 Now, you are ready to deal with Mickey, so make your path to get him his water. The nozzle isn't automatic, so you need to turn it on to fill the cloud with water. Shoot some cloud water at the first star before you make a path the next one. After you catch that star, send in the wind to shoot your cloud left so you can catch the last star. 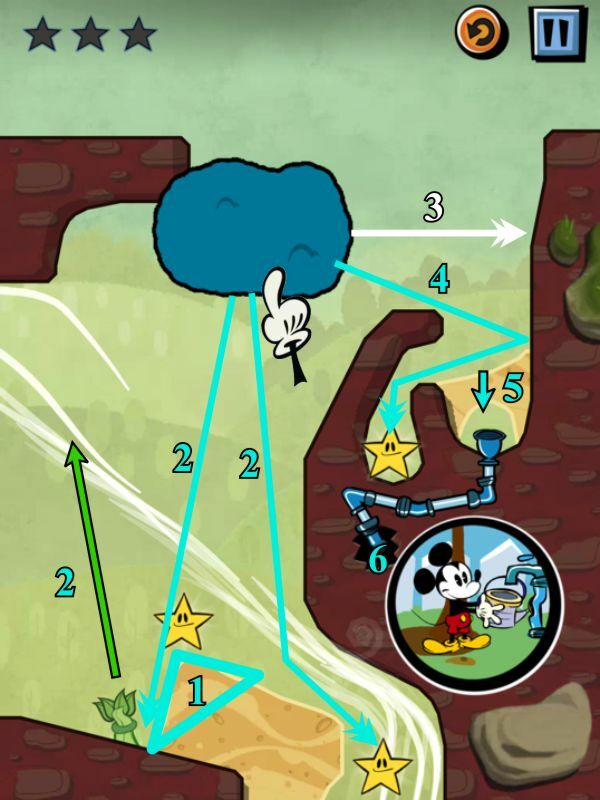 Make a path to Mickey's funnel and give him some cloud water. Turn on the nozzle to fill up the cloud. Catch the star at the right with some rain. Open a path and get the star below some water. Make a path to catch the wind and move the cloud to the left. Open a path to Mickey's funnel and send him some water. Turn on you nozzle with just enough water to catch the star. Open the path for the wind so you can move the cloud over to nozzle range. Turn on the nozzle and fill up the cloud. Swipe some cloud water to the star at the right. Carefully give a few drops of rain to the left cloud so you don't fan the flames. Send sufficient water down to the funnel to get it to Mickey. Open the path to the first star to capture it and the next star. If the water doesn't drip around and catch the next star, tap some rain on it. Turn on the fire to dissolve the cloud to get it out of your way. Open a path to the right star. Make a lower path from the remaining water pool that should capture the right star. If you don't uncover it, dig for Mickey's Dog Tag. 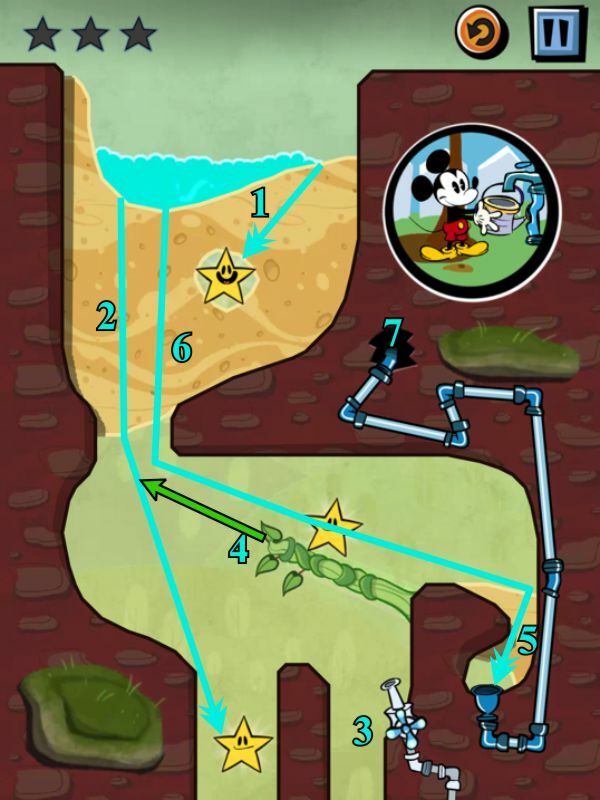 Make a path to send the rest of your water to Mickey's funnel. Open the right water path to the star and get some cloud water to catch the next star. Make a path from the left water collector to just the funnel with the cross so the gate opens. Release the fire to get rid of the cloud. 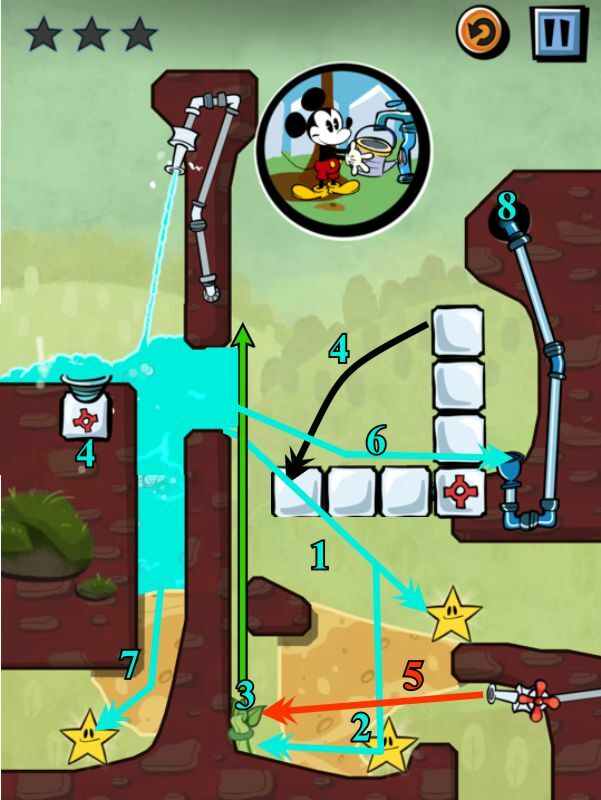 Open the path to the nozzle and it will shoot water to the last star and Mickey's funnel. Oops, look out for the stream of fire that appears. We will now need to do a work around. Open a tiny path and give some water to the cloud to the 2 stars at the left. Make a path to send the cloud to the right when the fire stream isn't active. 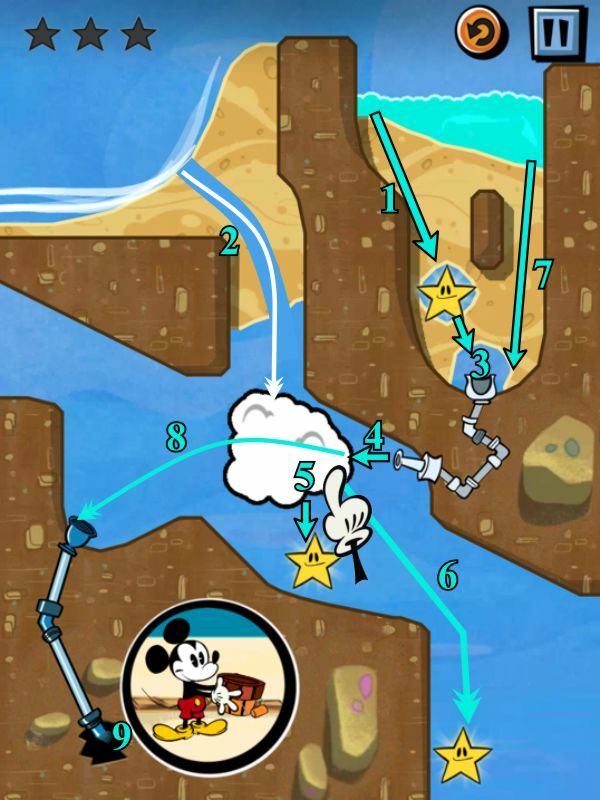 Once it safely gets there, tap on the cloud to get water to capture the star and get to Mickey's funnel. This is tricky because you have 2 clouds to juggle, so open the wind tunnel and the water reservoir at the same time. Your wind cloud will go down and sop up the fire and if there is a little leftover cloud might eventually combine with your other cloud. Since you also opened the water, you should have captured a star and filled up your right cloud, so tap on it to capture the right star. The wind is sending your water-filled cloud all around the area so try to rain on the last star so the cloud will eventually settle down by the funnel to Mickey. When your cloud settles down, send the water to Mickey. Be very careful with this one so you don't burn up the whole place. Check the screenshot for how to make your cuts. Once you have properly selected your paths, send your cloud up to the nozzle to fill it up with water. Now you can tap on it to take care of everything, and don't forget to pick up the Steel Bone on your journey. First off, let's let some water out to hit the cross opening and hit the first star. Your water will filter down and collect by the closed cross gate and your gear gate will close in the process. 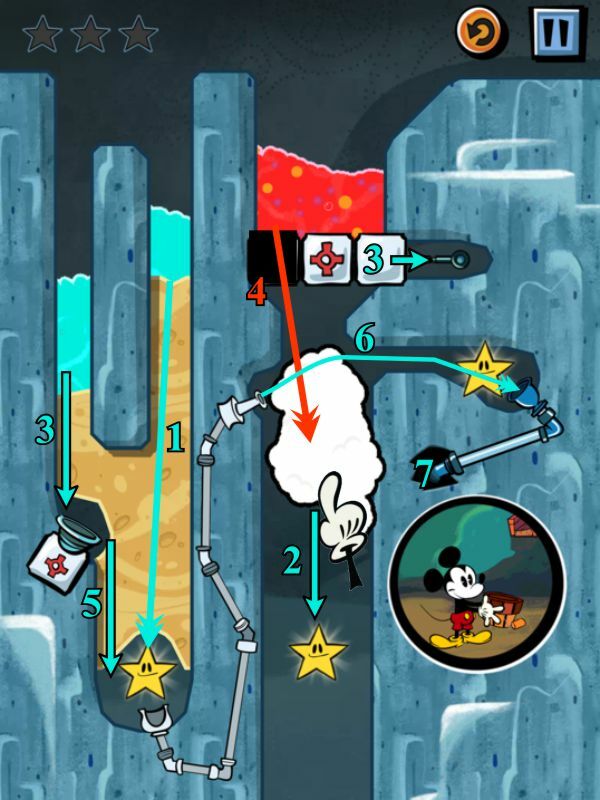 Now that everything is safely buttoned up, release the fire and it will close the cross gate so that your collected water will flow into Mickey's funnel. Open the lower water path and the bottom sand to catch the lower stars and open the gate. Let the fire go so it will close the gate. 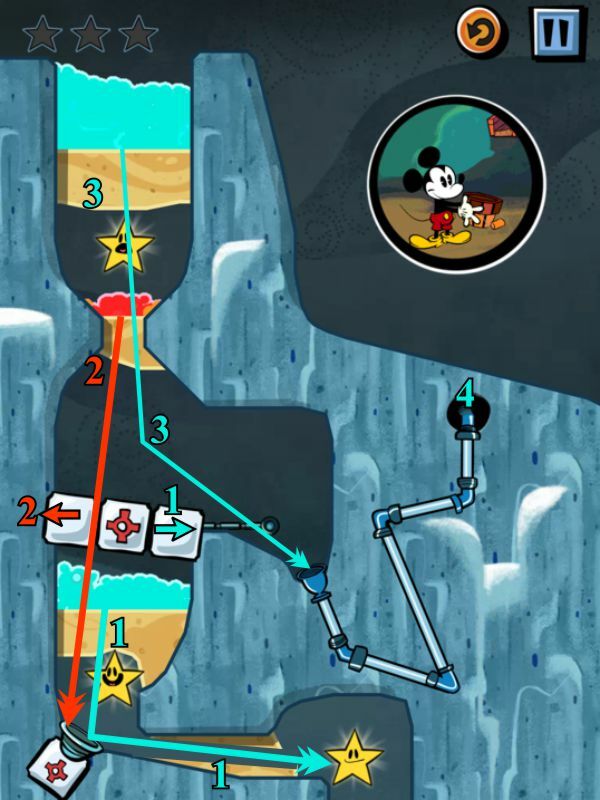 Open the upper water, catch the star and the water will go into the funnel to get to Mickey. Open the right water path and it will collect at the gate. Make a tiny path for the upper water to catch the star and open the left gate. At the same time, it will push the right gate up, spilling the water over to the next area. The leftover water at the far right will catch the bottom star. Open the fire path and both gates will go back to their original positions. Clear all the remaining sand in the area to reach the nozzle and find the Ground Breaking Stick. The nozzle water will hit the left gate and go down into the funnel to reach Mickey. Turn on the nozzle and make a small path to hit the top star. The water from the top water tap will open the gate. 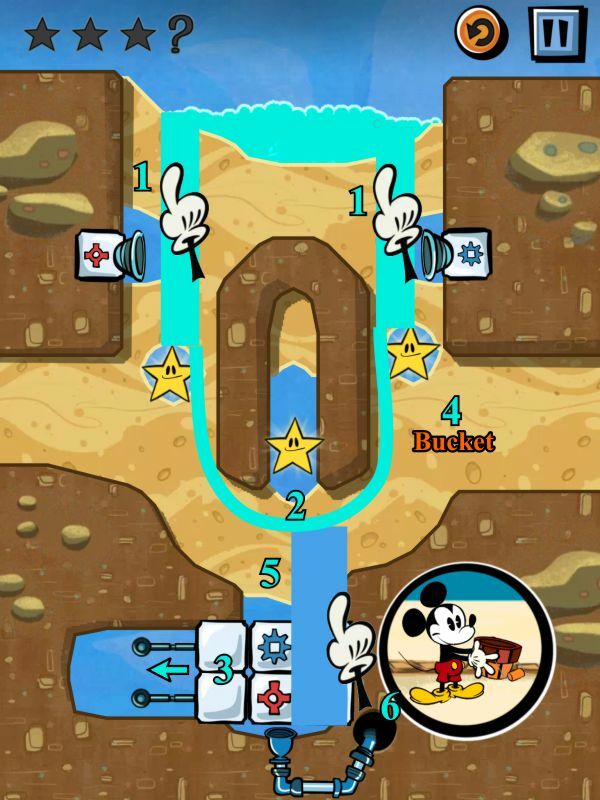 Keep tapping on the nozzle while you open the area to catch the other 2 stars and get the water to Mickey's funnel. The cloud will come down to cover the gate funnel, but the fire nozzle will then start to get rid of the cloud, so make sure your water gets to Mickey before the fire closes the gate. Tap on the cloud to get the first star and send water to the cloud below. Open the left lower path to let the cross winds blow your lower cloud to catch the lower right star. 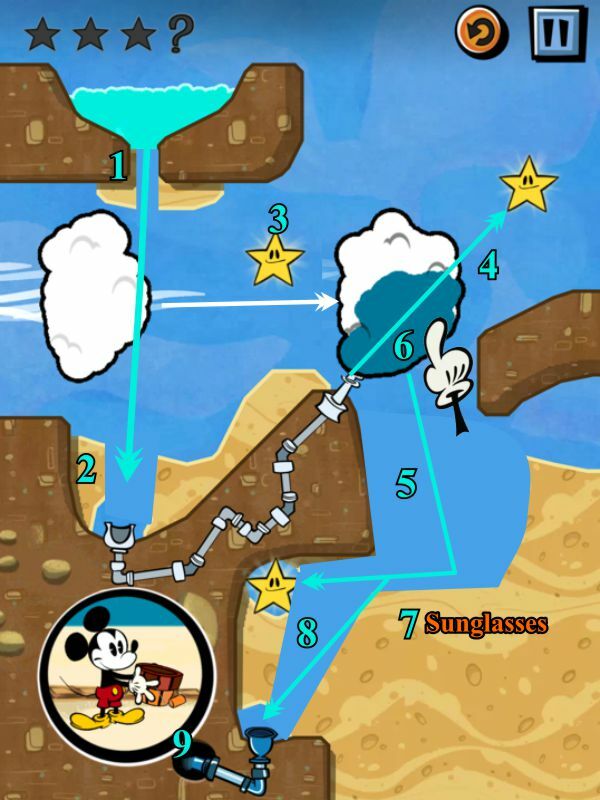 Clear the rest of the sand from the lower area to find Mickey's Shorts and send the upper cloud to the funnel to open the gate. The water will now catch the upper star and funnel down to Mickey. 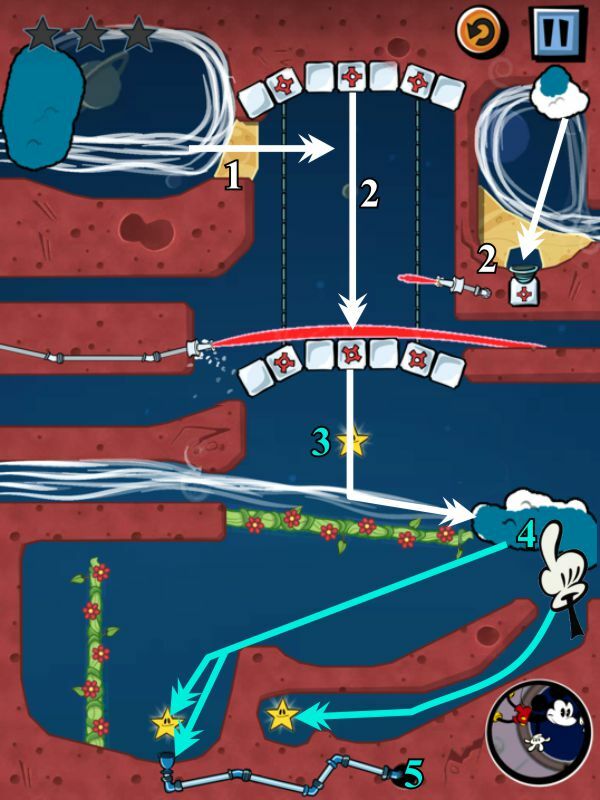 Carefully tap the cloud to only hit the funnel to open the red gate so you can catch the star. If you have a probably hitting only the red-gate funnel, take a tiny corner off the sand. Open the fire that will close the red gate and burn the funnel off blue gate. Make a path in the lower sand to drain the fire away. 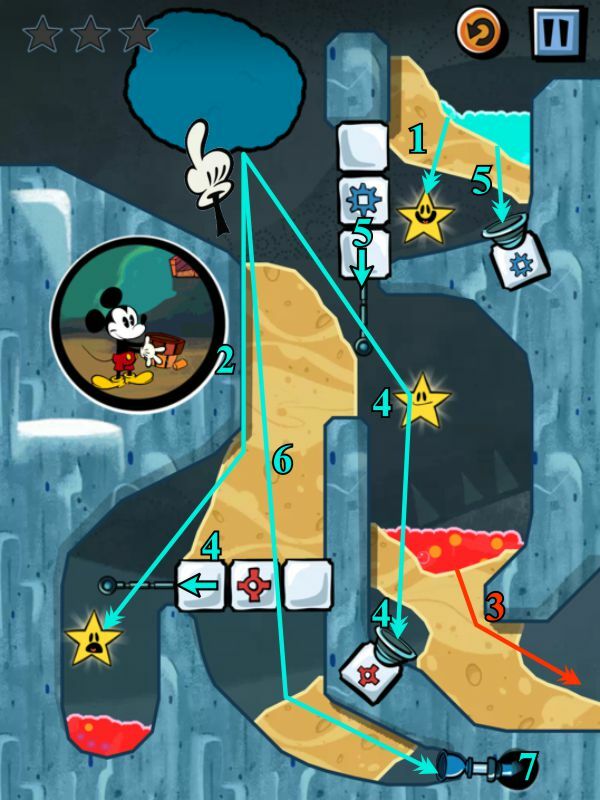 Open a path to the bottom star and Mickey's funnel. Tap on the cloud to get the water started down there and then open the path to the top star before the cloud runs out of water. Make a path to the gate funnels to open them. Also open a small path to the right cloud once the wind blows it up top. The lower cloud will cover the fire nozzle. Open the area to the left star, and clear away the sand at the left to find the Shiny Coin. Tap on the right cloud to catch the right star. 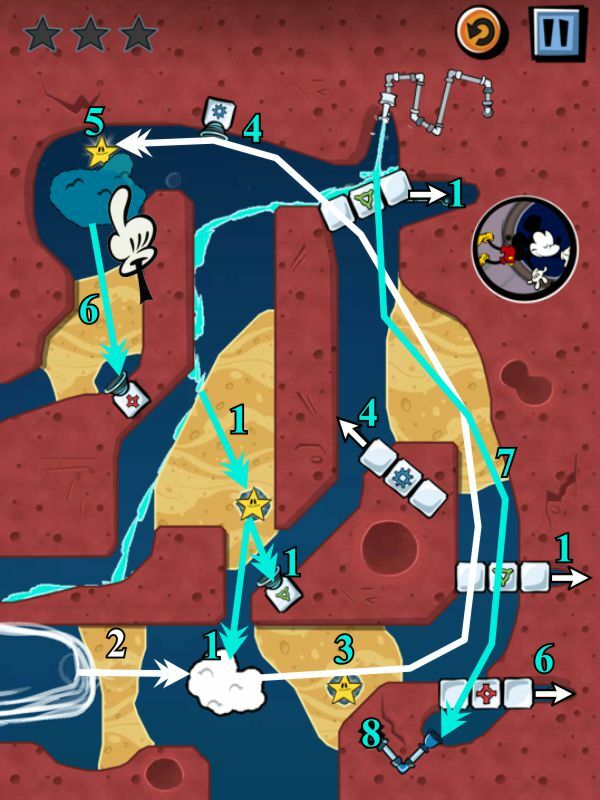 Open the center sand path to catch the remaining star and funnel to Mickey. Tap on the cloud to fill up the closed gates and open the wind gate. The wind will carry the cloud down to the fire to absorb it. Once it is absorbed, open the area to the funnel there. The left gate will open catching the star and open the right gate and make a path to Mickey's funnel. The water will catch the star to get to Mickey. Open the water path to catch the left star and send water to the nozzle. Both gates will open. Quickly make a path to catch the other star before the fire gate opens. The water nozzle will fill most of your cloud before the fire starts and closes the big gate. Catch the upper star with cloud water because the fire from the nozzle will reduce the size of the cloud as it whips around it and out of sight. Once the fire is gone, open a path the funnel for the water to get to Mickey. Open just enough sand to catch the upper star. Make a skinny little path to the left star and catch it with just enough cloud water as to not increase the fire. Carefully drain the right fire away without it getting to the funnel. Send cloud water to catch the remaining star and close the red gate. Open the upper sand to open the blue gate. Clear away a path in the lower sand so the water can spill over the blue gate and down to Mickey. Capture the right star with cloud water. Open the path to the green funnel and the gate will close, getting the fire out of the way. Make a path the get the bottom star and open the blue gate, which will push the cloud over to the wind. The wind will carry the cloud down in front of the red gate, so send water to its funnel and it will push the cloud to the right. Drain the cloud into the funnel to Mickey. Note: Vines are fully grown when they sprout flowers. Make a small path to filter the water past the star to capture it and then next star, and go on to the far funnel to Mickey. 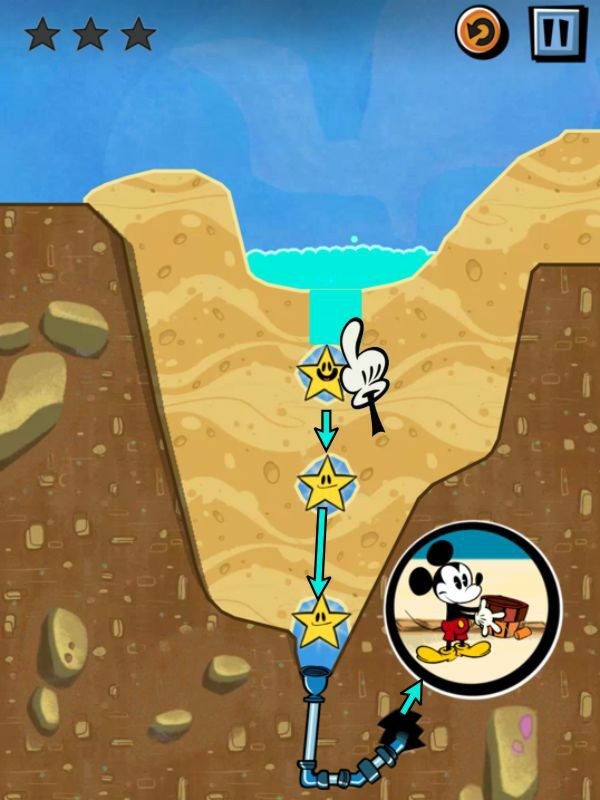 Quickly open up the sand from the top water to the left star to capture it before the water gets to Mickey. 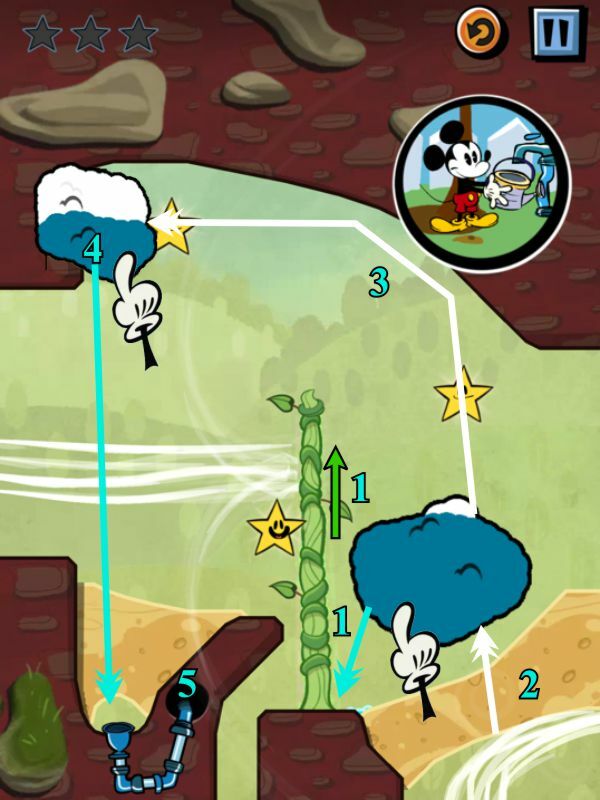 Tap the cloud to grow the vine and send water to the top star. The nozzle water will bounce off the vine to catch the right star. 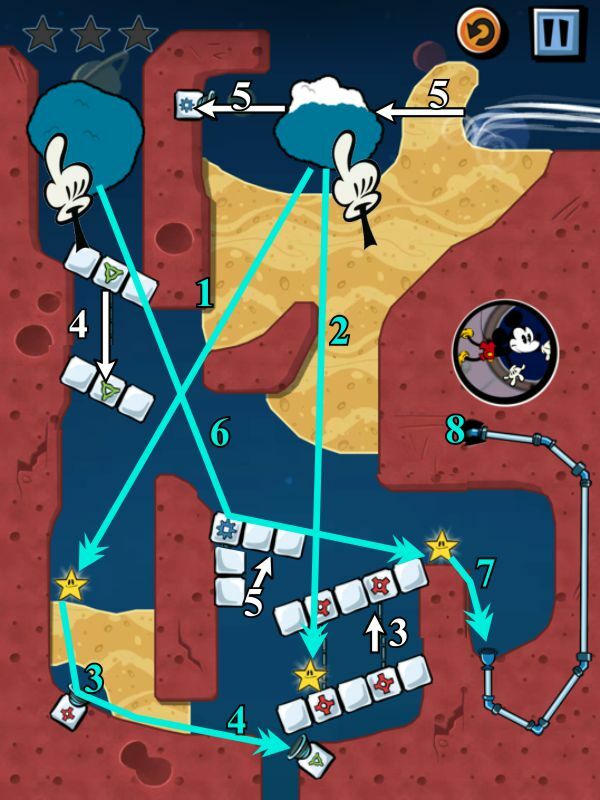 Make a path to the star in the sand and continue it to Mickey's funnel. In the meantime, widen the sand path to find the Sun Flower. Make a small path to catch the upper star and another small path to catch the lower star. Turn on the nozzle to make the vine grow. 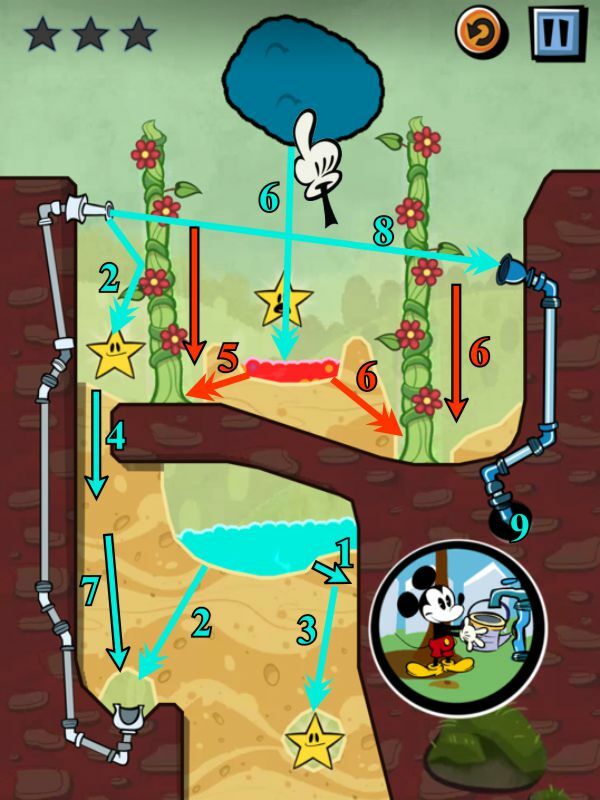 Open the path to Mickey's nozzle and send the rest of the upper water to him. Turn on the nozzle and send the water down to the right star. Make a path to send the fire to get rid of the vine. Use the nozzle to get the next 2 stars. Widen the path, as shown, to find the Dirty Thief. 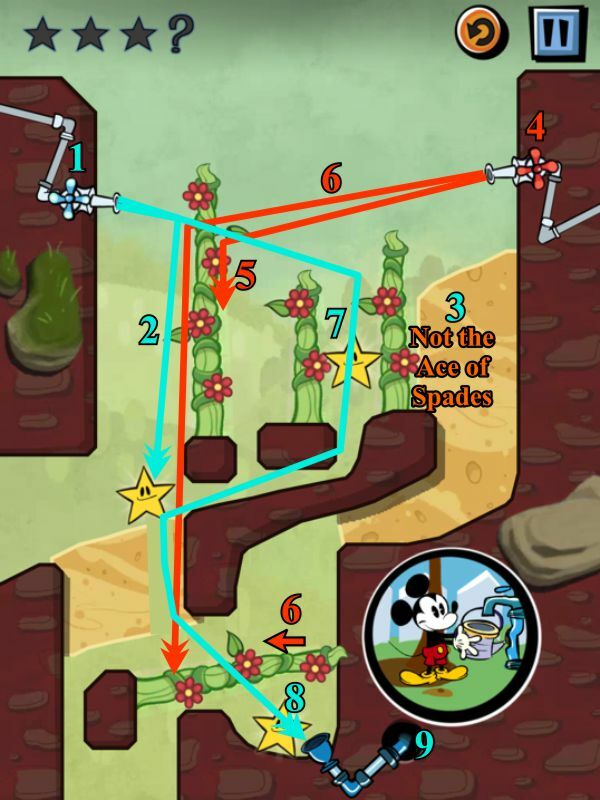 Open the path to Mickey's funnel and shoot the water from the nozzle down to him. Send a tiny bit of water to cut off the sand in the lower right of the scene so it will be saved. Open a path to the nozzle with the rest of that pocket of water. Use the saved water to catch the bottom star. The water that shoots out of the nozzle will hit the vine and the left star, so make a partial path in the sand to lower it. Send some of the fire to lower the left vine. 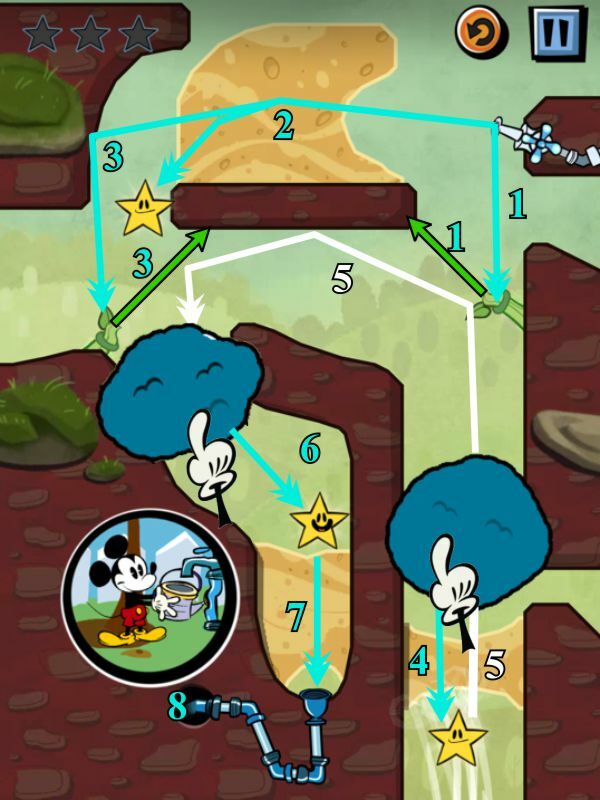 Tap on the cloud to increase the fire and then make a path to lower the right vine with the fire. Send your pocket of water down to the nozzle. The nozzle will now shoot water into the right funnel to Mickey. Take off the corner of the sand, as shown, and send down some cloud water to catch both stars and grow the vine. The wind will be redirected to move the cloud to the right, so tap on it to catch the star. 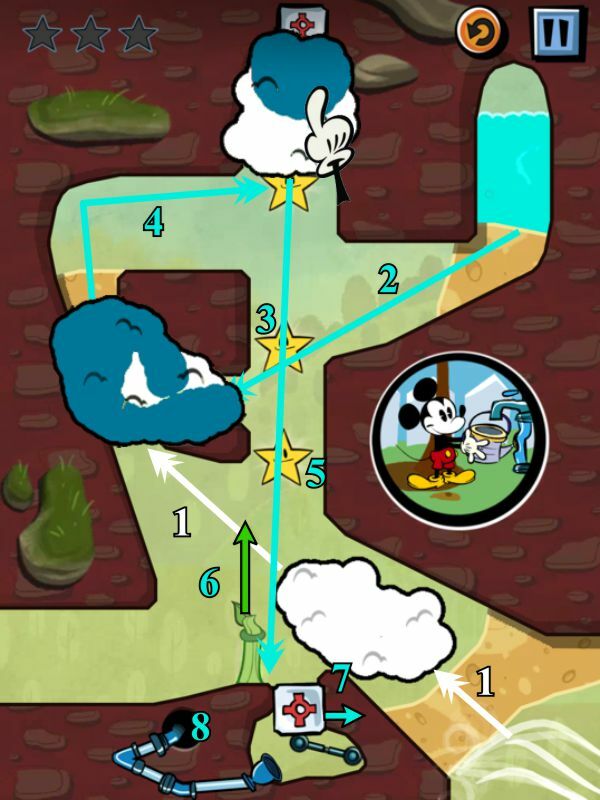 Open the path to Mickey's funnel and send the cloud water to him. Send some nozzle water down to grow the right vine. Make a path through the upper sand to catch the star. Redirect the path to hit the formation and flow down to grow the left vine. Open a small path to the lower star and catch it with some cloud water. Widen the path so the wind will carry the cloud up and over to the left side. Catch the star with the cloud water. Open a path to the funnel and send water to Mickey. Send water from the upper cloud to fill up the lower one. Open the upper wind path to send that cloud to the right. Grow the vine to reach the left formation. Make a path in the lower sand to catch the star with cloud water and let the cloud travel around with the wind. The cloud will catch the star in its path. Send cloud water down the funnel to Mickey. Turn on the fire nozzle to get rid of the vine. Make a path for cloud water to get to the upper star. Remove the sand area shown in the screenshot. The wind will move the cloud to the lower area. Catch the left star with rain, and the cloud will catch the right star when it hits it. 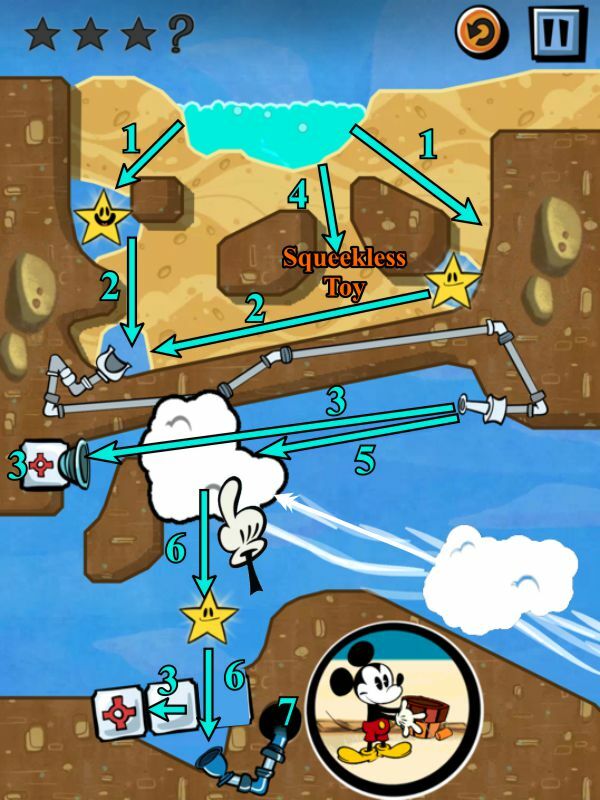 Open a path to Mickey's funnel and drain the cloud water. Make a pocket for the fire. The nozzle water will hit the vine and drip down, so make a path to the lower star and continue down to the nozzle funnel. You should be able to pick up the Loud-mouthed Bird on the way. Send your pocket of fire down to the nozzle funnel and it will shorten the vine so the water nozzle can fill up the cloud. Send the cloud water to Mickey. 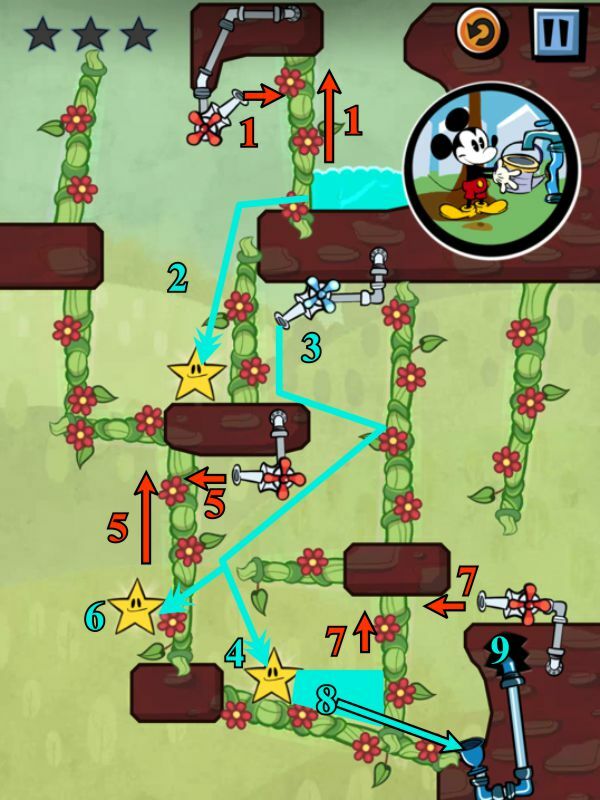 Make simultaneous paths to both stars and down to the nozzle funnel so it can get the upper star and send water to Mickey before the vine blocks it. Meanwhile, carefully uncover the Redundant Gloves. Rain on the vine so it blocks the cross wind. Open the lower wind path and the cloud will catch the stars in its path, except for the one to the left of the vine that you will need to catch with cloud water as it passes. When the cloud settles, open the path to Mickey's funnel and send the cloud water down there. Turn on the water nozzle and send water along the vine to catch the left star. Dig in the sand at the right to find the Not the Ace of Spades. Turn on the fire nozzle to shorten the far left vine. Make a path in the lower sand just under where the star was located and send fire down to shorten the lower vine, but don't kill the star. 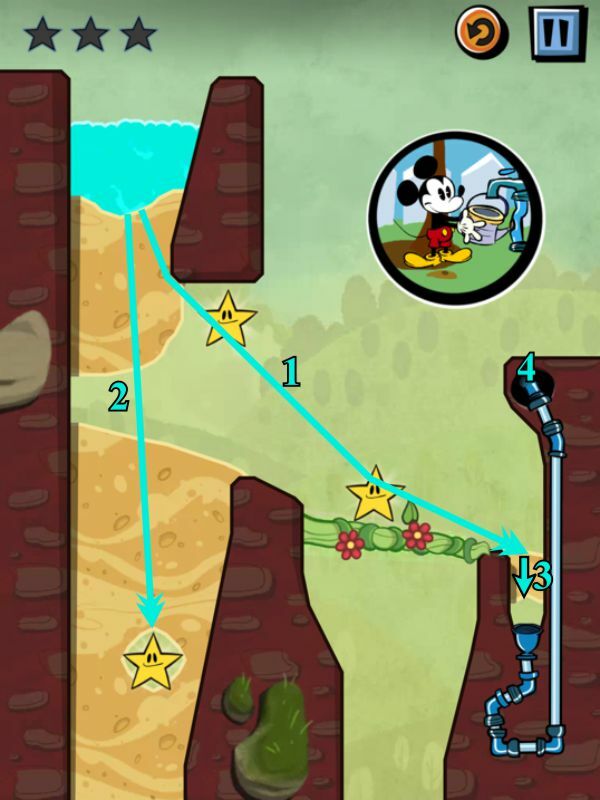 Tap the water nozzle to send water to capture both remaining stars and into Mickey's funnel. Open the wind path to send the cloud up to the left sand area. Send the water in the reservoir to catch the star and fill up the cloud. Open the sand above the cloud so it travels to the top of the scene, catching the top star on its way. Send water down to capture the remaining star and grow the vine to cut off the wind so it redirects up to smash the cloud into the funnel to open the red gate. Send the rest of the water down to Mickey. Open a tiny path to catch the far right star with rain. Widen the path to catch the lower star and grow the vine. Unleash the wind so the cloud goes to the left. Send the fire down to the nozzle in a small path at the left. Take part of the corner of the sand off to catch the last star with cloud water. Open up the sand to send the remaining cloud water to the nozzle and it will shoot it over to Mickey. Turn on the water nozzle and the water will shoot off the vine down to fill up the crevice. Keep filling the crevice until it overflows catching the left star. Open the sand path and the water will flow down to the cloud. Shoot down a little more nozzle water to fill up the cloud, and you will catch the lower star. Open the fire nozzle to shorten the vine so the water nozzle can reach the funnel to open the gate and catch the star below. 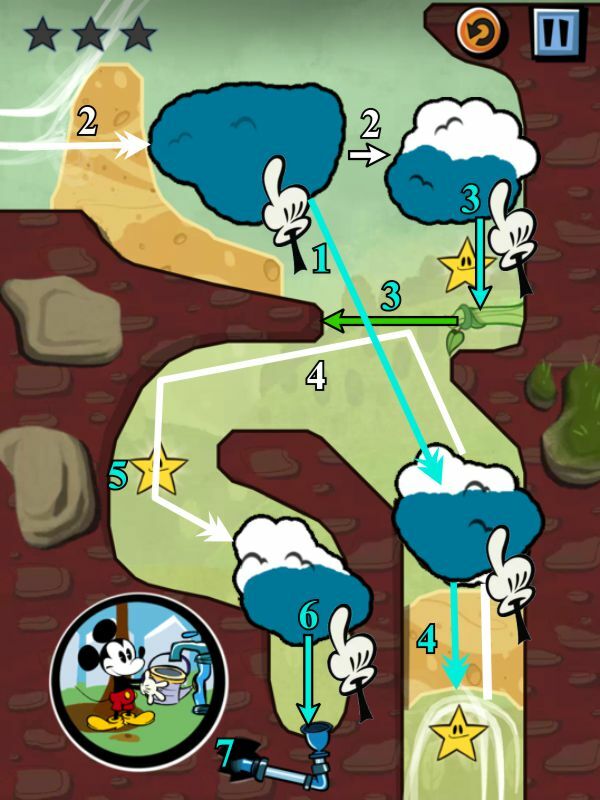 Once the gate is opened, unleash the wind to send the cloud to the right so you can send its water to Mickey. When your well of nozzle water overflows the lower formation, it should capture the higher star. Make a path to the lower star and then to the vine so you can capture the star and grow the vine. The water will be contained and spill over into the funnel to bring the gate down. Turn on the fire nozzle and make a path to shorten the vine so the water will flow across the gate to Mickey's funnel. At the same time, make sure you open a path to send some nozzle water down to the last star. Open the nozzle and bounce water off the vine to catch the upper star. Make a small path to get the water to the middle star. Make another path down to the red gate funnel and catch the Amazing Treat on the way. Once the red gate opens, it will get rid of all the vines, open the blue gate by destroying it, and close itself via a path you make to the red gate funnel. 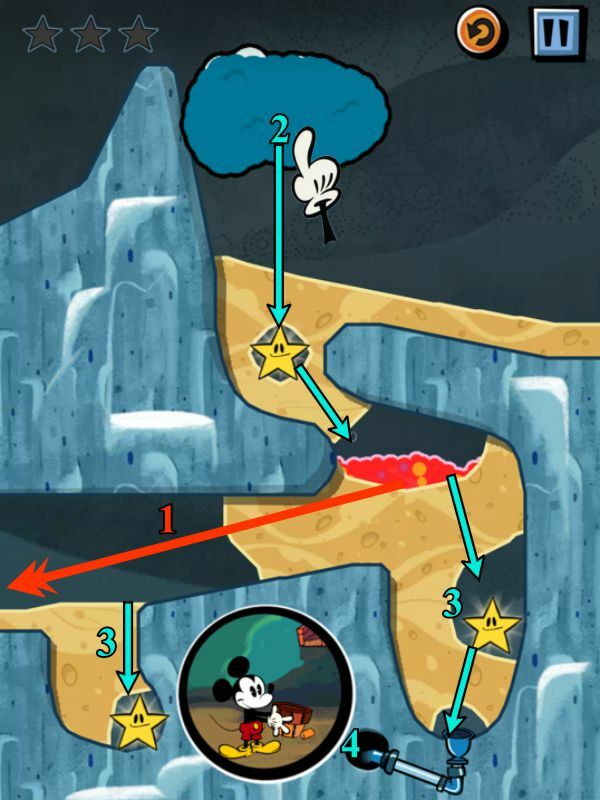 Open a path to catch the lower star before you make a path to Mickey's funnel. Turn on the water nozzle and shoot the cloud full of water and catch the bottom star. Tap some cloud water into the funnel for the red gate so it closes. Once the gate closes, send some cloud water down to catch the bottom star and grow the vine. Send the nozzle water up to the closed gate so it will bounce off and get the lower star. Open the upper path and the wind tunnel so the cloud will travel up and capture the top star. Send some of your cloud water down to Mickey. Turn on the upper fire nozzle to shorten the closest vine, and the water will spill down to capture the upper star. Turn on the water nozzle to catch the bottom star and fill up a reservoir of water. Use the middle fire nozzle to shorten the vine blocking water from the middle star. Turn on the water nozzle to capture the middle star. 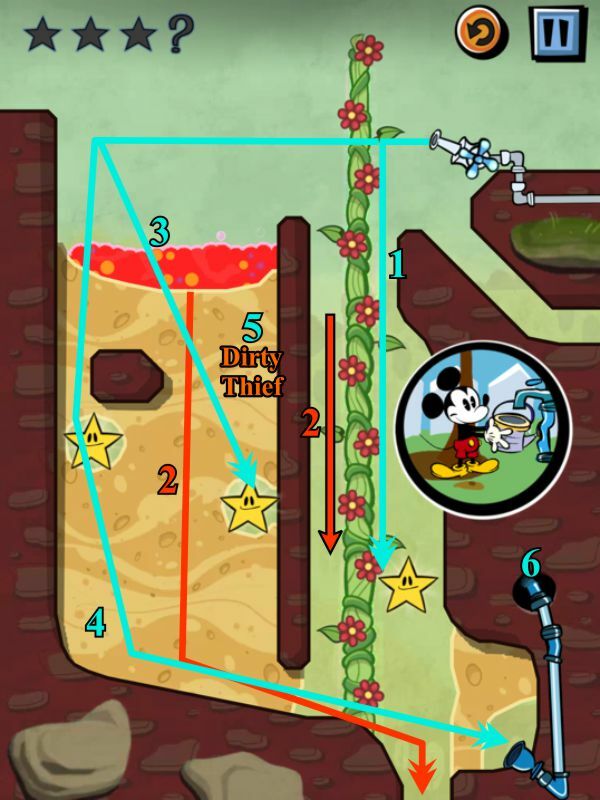 Shorten the vine blocking the water to Mickey and your reservoir of water will reach Mickey's funnel. Make a path through the spiral to the star. Continue the path until the water gets to the nozzles. The nozzle water will catch the top star. Make a path to the left star, and then on down to Mickey. Make a water path to the left nozzle. The water will catch the middle star and make a reservoir in the upper left area. Cut off the upper left sand corner without making a path to the star. Make a path for the fire to hit the right nozzle and shoot up and over the left sand to disappear. Send a tiny bit of water to the right star and send the rest down to the right nozzle. 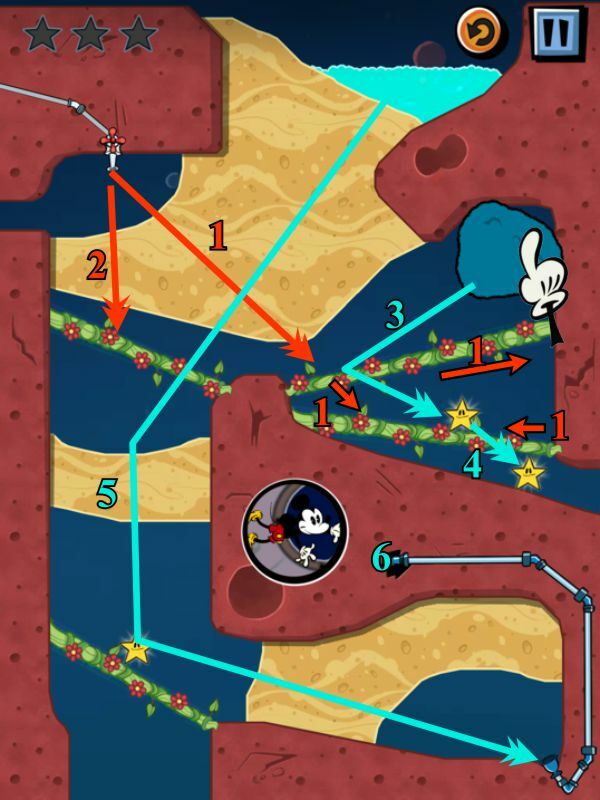 Open a path for the nozzle to shoot water up to the left star, and another path down to Mickey's funnel. Open a path for the wind to send the cloud down to soak up the water. Make another path for the cloud to travel up and catch the 2 stars in its path. When it almost gets to its destination, tap a small reservoir that you can open and catch the bottom star. Finally, send the rest of the cloud water down to Mickey. Open the wind stream to the cloud, and it will go down and travel to the left. Open another path at the left: it will direct the air down and send the cloud down and around to the water nozzle through a path you make at the right. 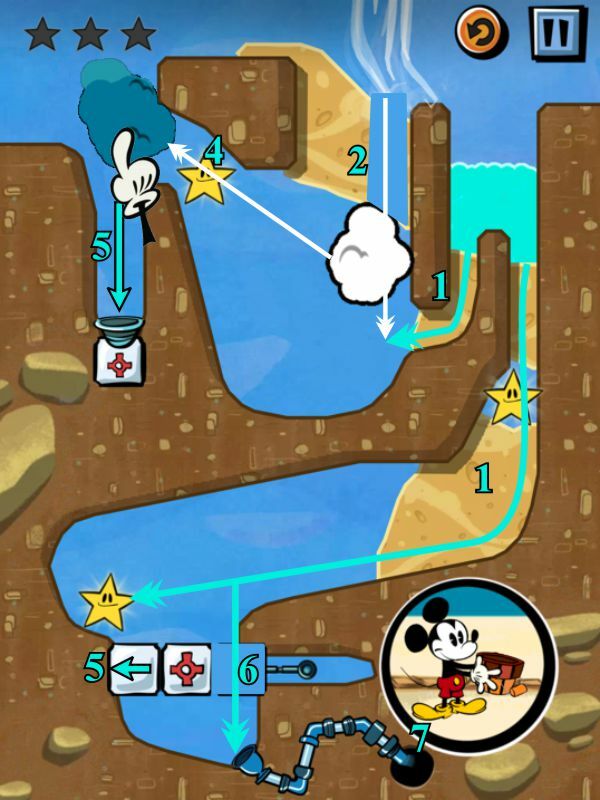 Send the reservoir water down to the cloud and make paths to the stars and Mickey as shown in the screenshot. Tap cloud water into each path in the order shown. You need to work quickly because fire is spiraling down to the left. Make a path to send the left portion of the fire off to the right, and widen the path to get rid of the right fire reservoir. Make a skinny path to the nozzle and another path to catch the star. Extend the path down from the bottom star to Mickey. 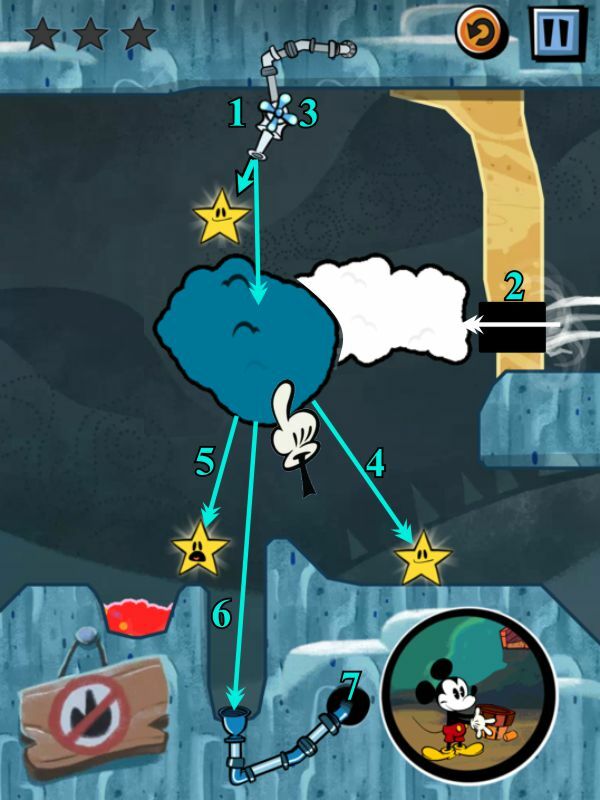 Meanwhile, the nozzle will catch the top star and fill up the cloud, so tap it to get the final star. Catch the bottom star with the cloud water. Unleash the wind in a circular path so the bottom cloud will move to the funnel. The blue gate will now open. Make a path to the lower star and tap on the cloud under the red gate funnel to catch it. Open the wind path so it goes upward. The wind will now push the cloud to the funnel to open the red gate. Now that 2 gates are open, the nozzle water should catch the top star. Continue the wind path to push the cloud to the next gate funnel and the green gate will open. Keep the wind path going until it reaches the far left cloud. The cloud will push up to the funnel and open the final gate. The nozzle water can now flow down to reach Mickey's funnel. 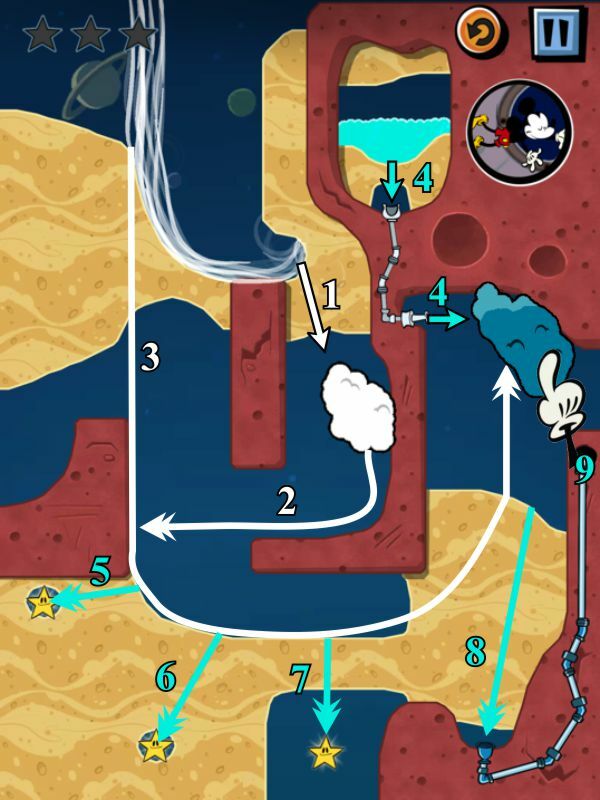 Open the lower right reservoir and the following will happen: all gates will close when the water reaches the funnel, and the top reservoir will send water down to the sand pocket. Make a small path to the left star to capture it. Make another tiny path to the right star because we want to preserve our water. Open a path to the bottom star in the sand and create a new reservoir. Send the fire down to the funnel to close all the gates. Now that the lower gate is open, send down your reservoir to Mickey's funnel. Make a path through the sand and tap the right clouds to catch it. Make another path to catch the lower star with cloud water. 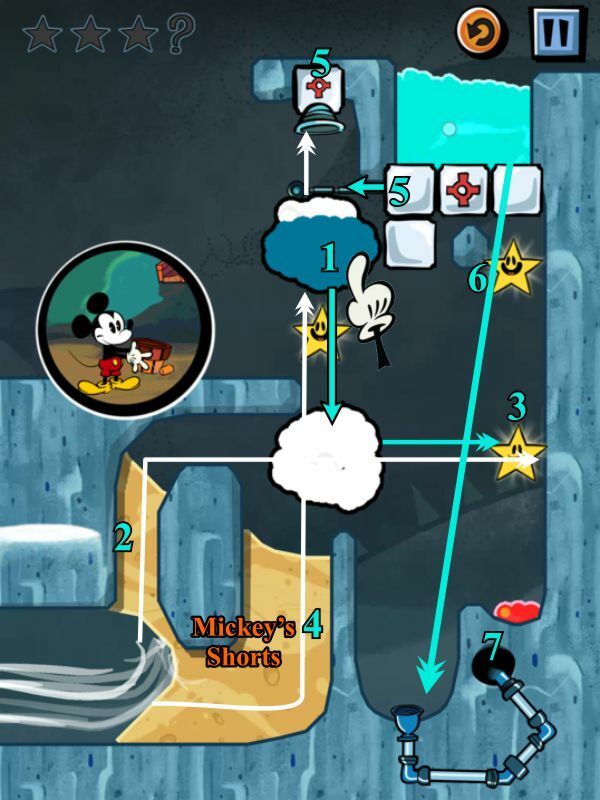 Open the path below the left cloud, and you can hit the funnel with cloud water to move the red gate up. Continue the path in the sand below to catch the green funnel and move it. Open the wind to send the cloud over to the blue funnel. Now that the path is open and the gates situated, tap on the cloud to send water down to the right star. 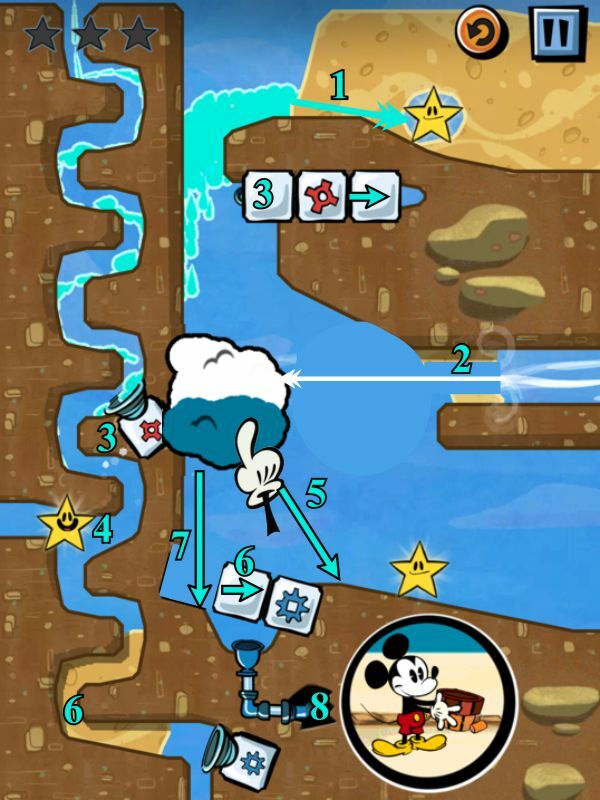 Continue tapping on the cloud until water gets to Mickey. Send nozzle fire to shorten the 2 right vines. Make another path and send more fire to shorten the left vine. Send cloud water to bounce off the dead vines and capture the 2 right stars. 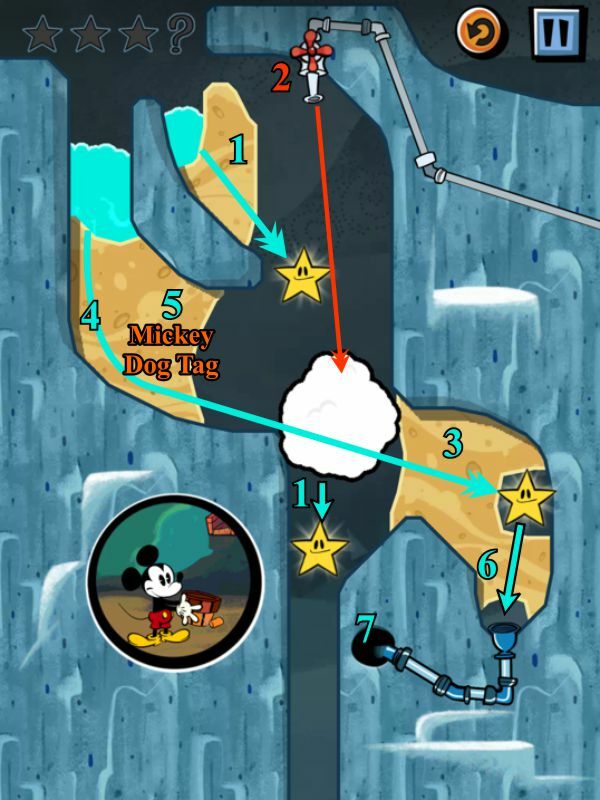 Release the top reservoir in a path to catch the lower star and get to Mickey's funnel. Tap on the cloud to catch the bottom star. 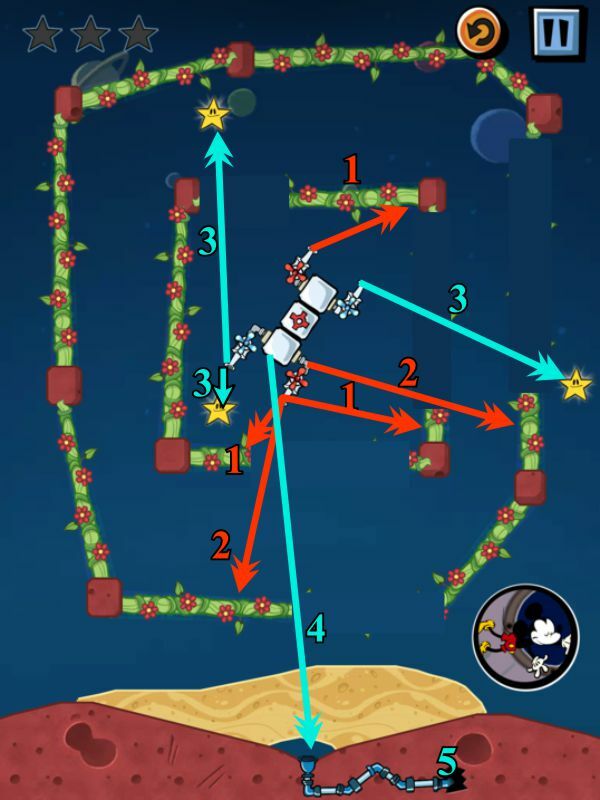 Make a wind path in the maze as shown in the screenshot. The wind will move the cloud over and catch the star in its path. Open the maze water reservoir shown and capture the star in the maze. Release the cloud water to Mickey. Open the wind path on the left so the cloud come out under the gate. Open the path on the right so that the cloud will send water to open the gate. 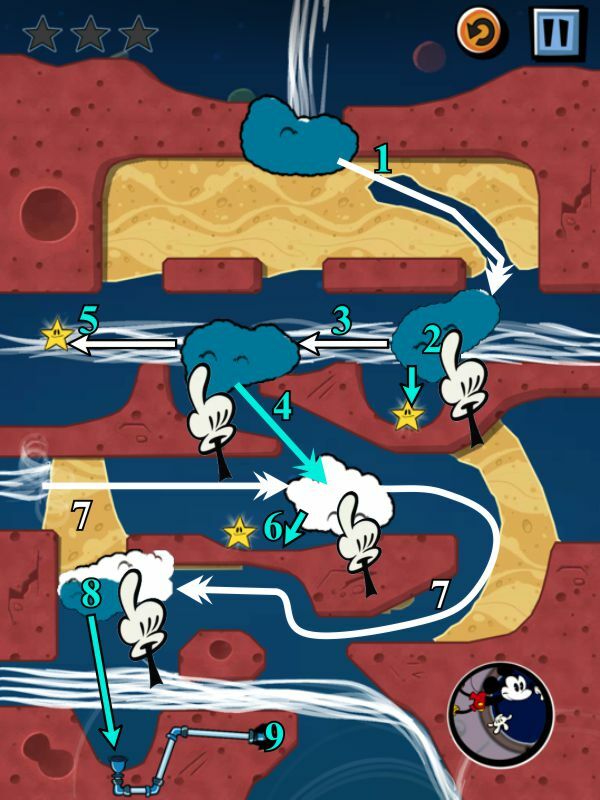 The gate will open to the area shown in the screenshot, pushing the cloud past the upper star. Be careful to time it all so the fire doesn't hit the cloud. The lower wind will push the cloud to the right. 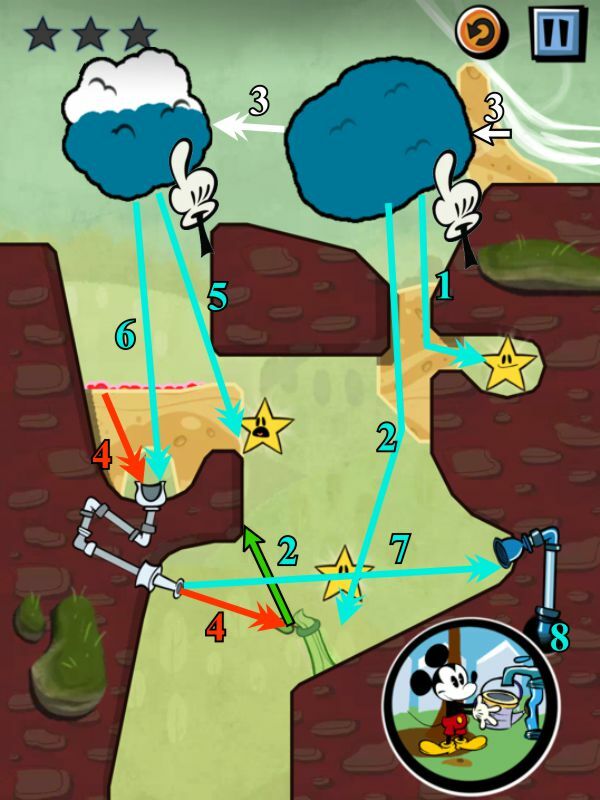 Tap on the cloud to send the water to capture both lower stars and go to Mickey. You can tap on the right and left sides of the cloud to better direct the water. Turn on the top nozzle and send water to catch the top star and make a reservoir. Use the fire nozzle to shorten the vine in its path. Shoot water from the bottom water nozzle to grow the right vine and the short lower right one. Once the path is blocked, send water to the gate nozzle so both gates open. The top reservoir with catch the left star and grow the vine there. Open the air path and the cloud will hit the vine and go through the gate. The cloud will catch the star in its path and bounce off the vine to go downward. 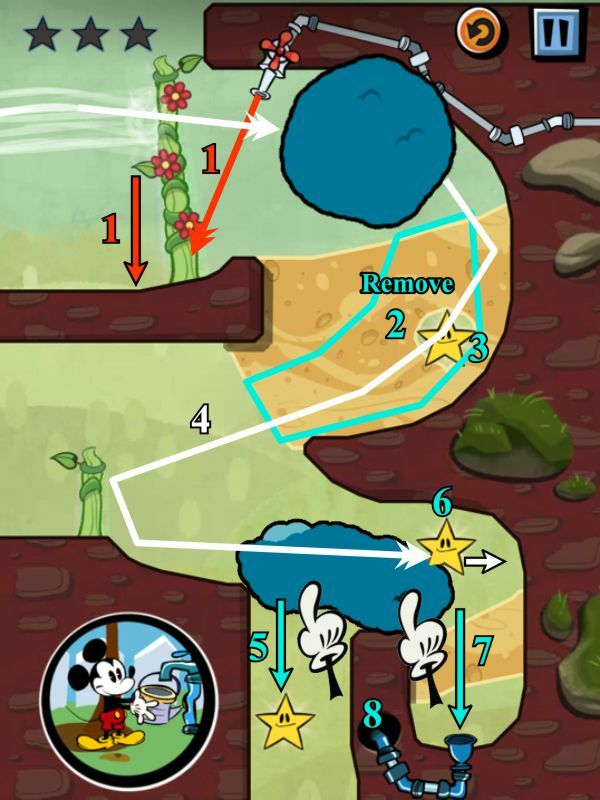 Open the path to Mickey to send cloud water to his funnel. Make a path and send cloud water down to the right star, creating a reservoir for later use. Tap on the lower cloud to send water to the green funnel so the gate will open. Send your water reservoir down the blue funnel once the gate is open. Open the upper wind path. The cloud will move left, catching the upper star. Since the blue gate is closed, send cloud water down to form a reservoir on the gate. Open the lower wind path. The cloud will move over to the red funnel and open that gate. 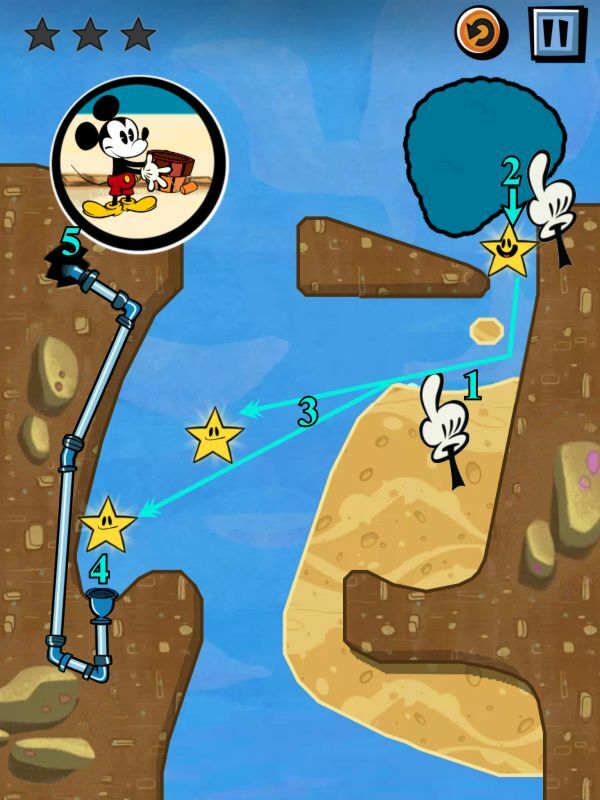 Your reservoir of water will flow to Mickey, catching the bottom star in its path. Tap on the lower cloud to catch the star and open the gate which will block the left fire stream. Catch the middle star with that cloud. Open the right wind path, and the upper cloud will catch the star on its way to the red gate funnel. Open the left wind path to send that cloud over to the blue funnel to send that gate upward. 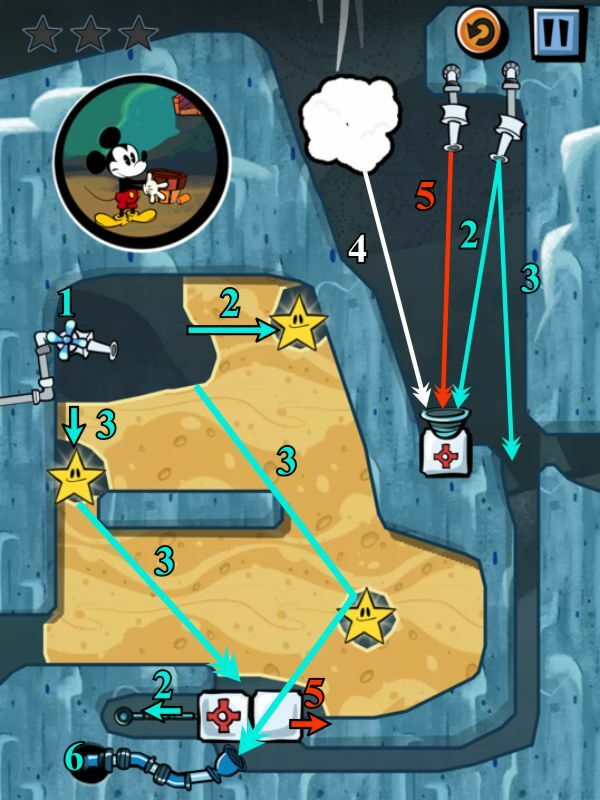 Clear the area to Mickey's funnel, and turn on the water nozzle so it will send a stream over the blue gate to Mickey. Open the water path to the green gate funnel and the gate will block the lower water nozzle. Send water to the blue gate funnel, and then open the path to the red gate funnel. Shoot water from their closest nozzle to capture each of the stars. Send some extra water down to the fire to increase it. 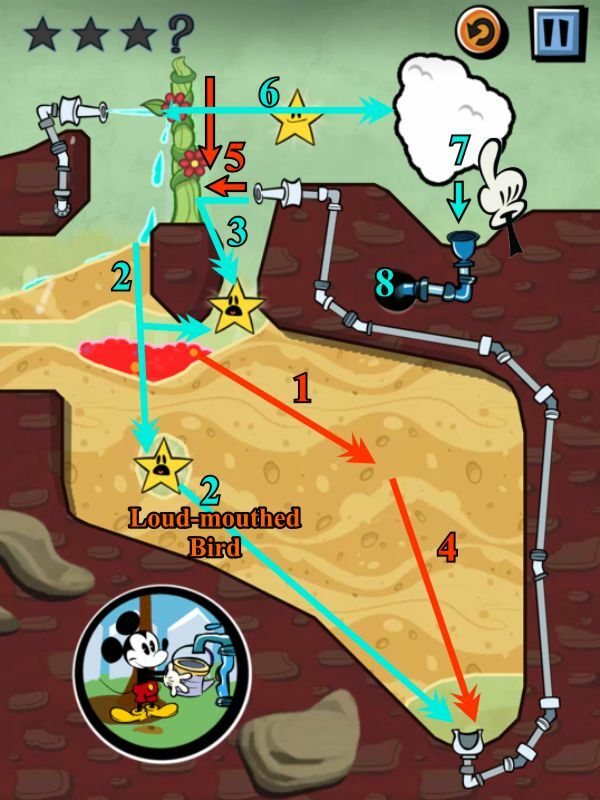 Fill up a reservoir at the bottom that will shoot up to Mickey when all the gates open the path. 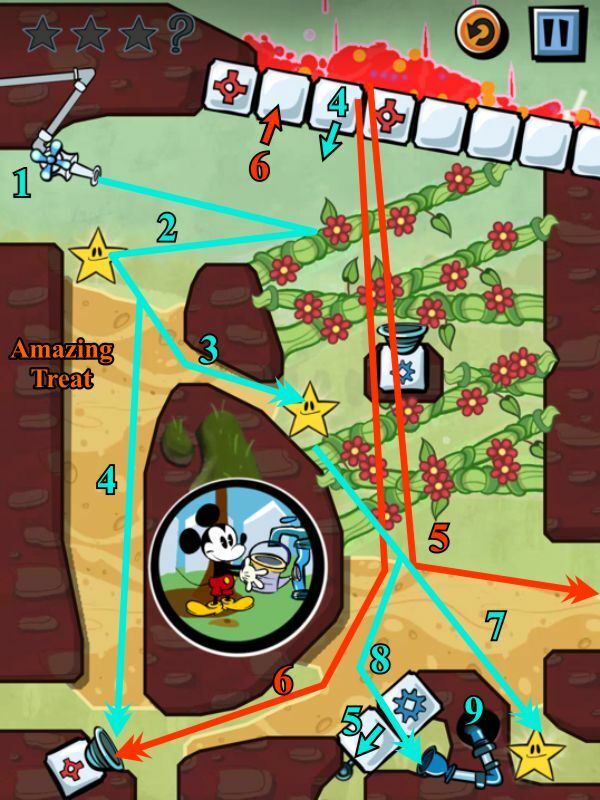 Open a fire path to each of the gate funnels, and Mickey will get his water. Open a path and send water down to the nozzle to fill up the cloud. You can either keep sending water to hit the lower right star, or use cloud water and fill up the cloud again. Open the wind path and your cloud will hit the blue gate funnel and situate itself under the red gate. Send more water from the top nozzle and it will catch the lower left star. Open a path for the extra water to go to the nozzle and hit the red gate funnel. You cloud will go up and catch the green gate funnel and go to the right. 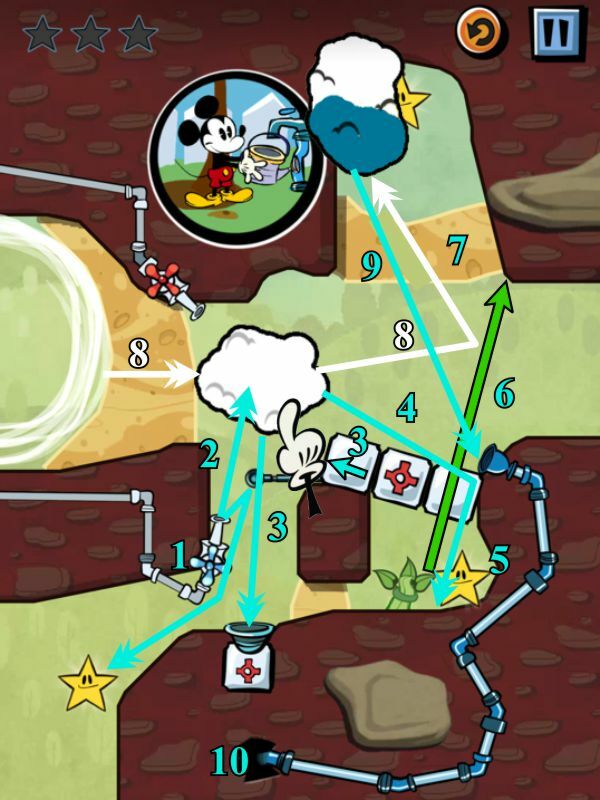 Send your water reservoir down to the right star, and use your cloud to send water to Mickey. Open a path to the middle star and keep going so the flowing water will also open the green gates and fill up the cloud. Clear the way for the wind to send the cloud all the way up and around as shown. It will catch the lower and upper stars on its way, as well as the blue gate funnel. Send the cloud water through a path to the red gate funnel, and the water flow will be redirected down the path to Mickey. Make a path to the left star and the area to the right to make a reservoir in each area above the nozzle funnels. Send water over from the top nozzle to handle the water part of the task. Send water to the lowest nozzle to grow the vine. Open your reservoir from the left star to send water to catch the top right star. Open the path to the middle nozzle to grow the vine to maturity. Send water from the top nozzle, and it will bounce off the vine to fill your upper cloud and make a small reservoir in the bottom sand. Tap water from the upper cloud into the lower cloud so you can send cloud water to the lower right star. 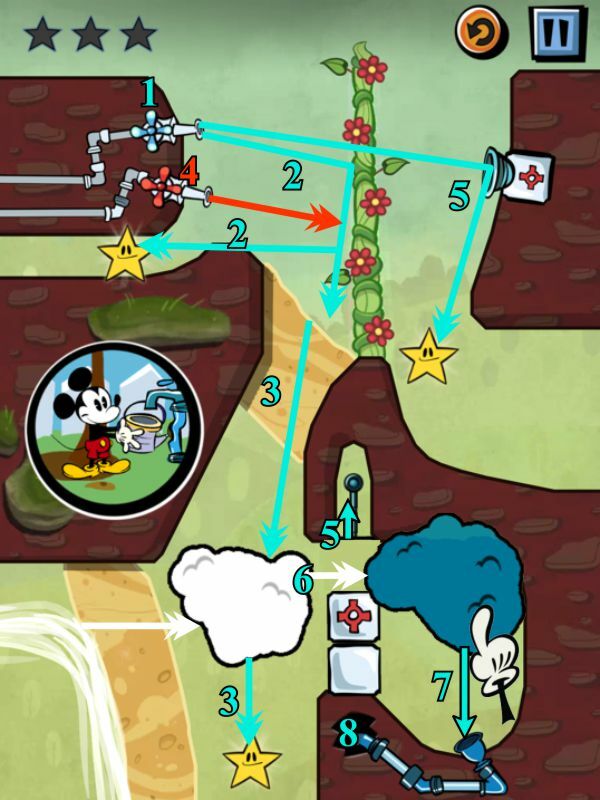 Open a path to Mickey's funnel and send more upper nozzle water to it so it will get to Mickey. First off, look at the screenshot to see the preliminary paths you should make before you embark on this venture. Open the rest of the upper sand to send the cloud to the position above the star and get it. As the cloud travels across start tapping water into the lower cloud but save enough to capture the left star in the cloud's path. 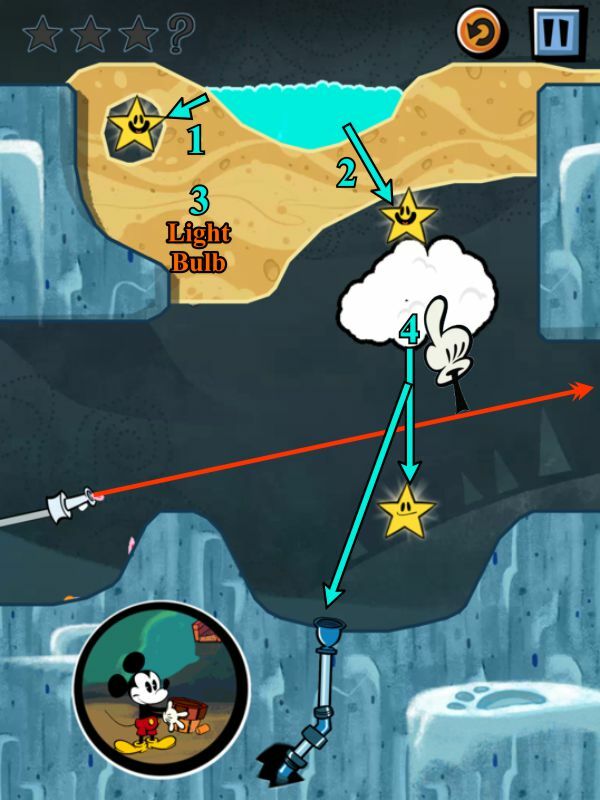 Catch the star next to the cloud and then unleash the left wind to send the cloud around and across to just above Mickey's nozzle. Give Mickey his cloud water and you're done. This level is tricky because your gate with the nozzles is rotating. You have two alternating water and fire nozzles to work with, so use the ones closest to what you want to do during the rotation. Use the fire to get rid of the vines first, and aim to the areas shown in the screenshot. You will kill off the interior vines first and then go for the two outer vine areas that you need gone. 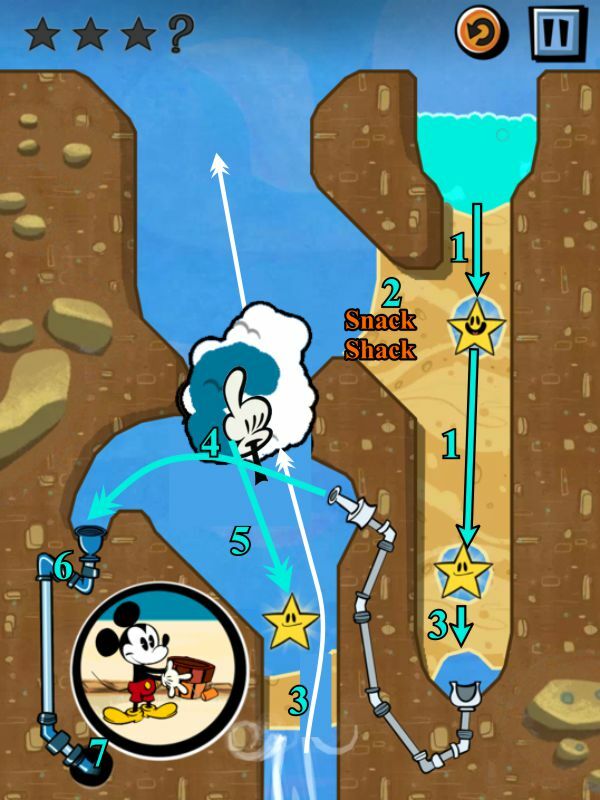 Shoot your water to catch the stars, then open a path to Mickey's nozzle and shoot water there. After every 3 items you collect, a combining clouds bonus level will become available. You begin with 3 stars and after a certain length of time, your stars start to disappear so this is a timed race. Exploding Beach Ball: Level 4. Head Trapping Bucket: Level 8. Flowing Fetching Stick: Level 17. Bright Bulb: Level 2 . Mickey's Dog Tag: Level 5. Ground Breaking Stick: Level 12. Mickey's Shorts: Level 14 . Not the Ace of Spades: Level 13. You can take a sneak peek at the Goofy episodes to decide whether you wish to purchase them. On the main screen for each episode, you can play the scene at the bottom of the screen. 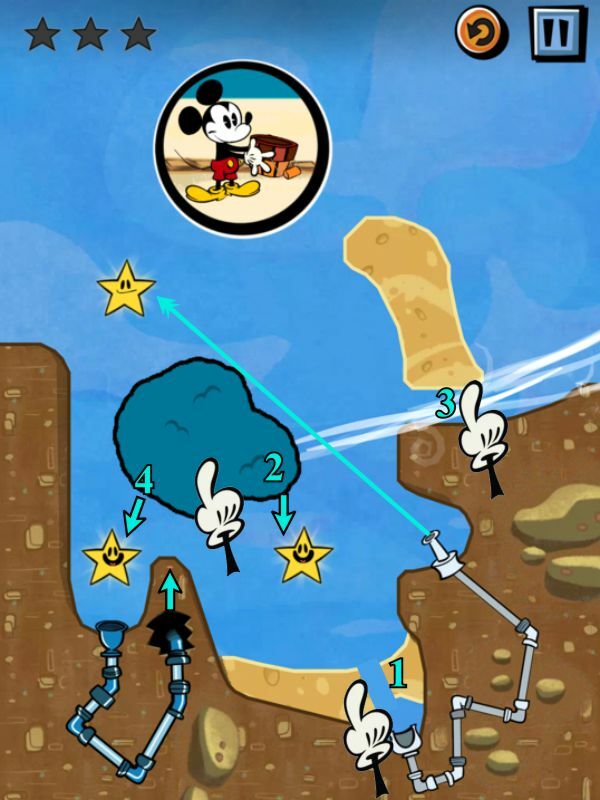 For every 3 of Pluto's Collectibles that you find, there is a bonus cloud combination level. There are also secret levels you can play. 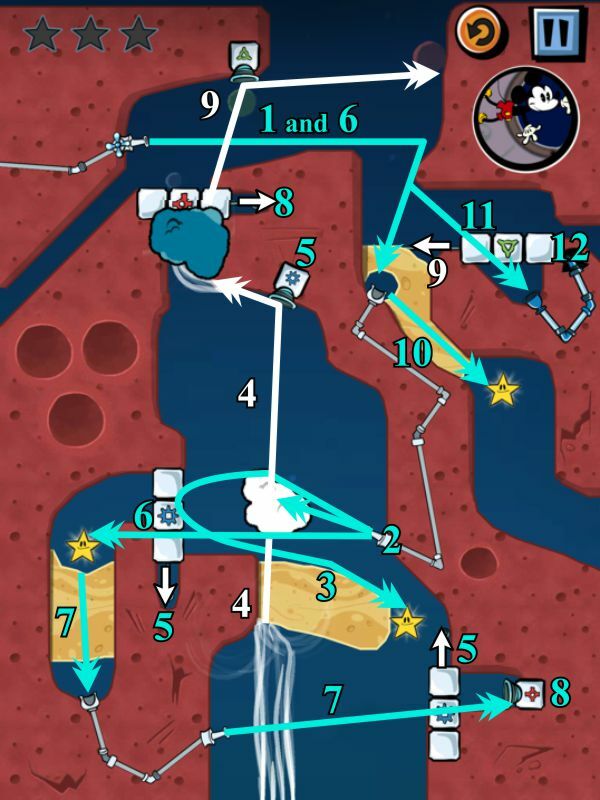 I found the following levels, so since we didn't cover the Goofy Episodes, hope you will share if you find more than I did. Go to your Achievements and pull down until you see the clock, and tap on it to play the Coo Coo level. 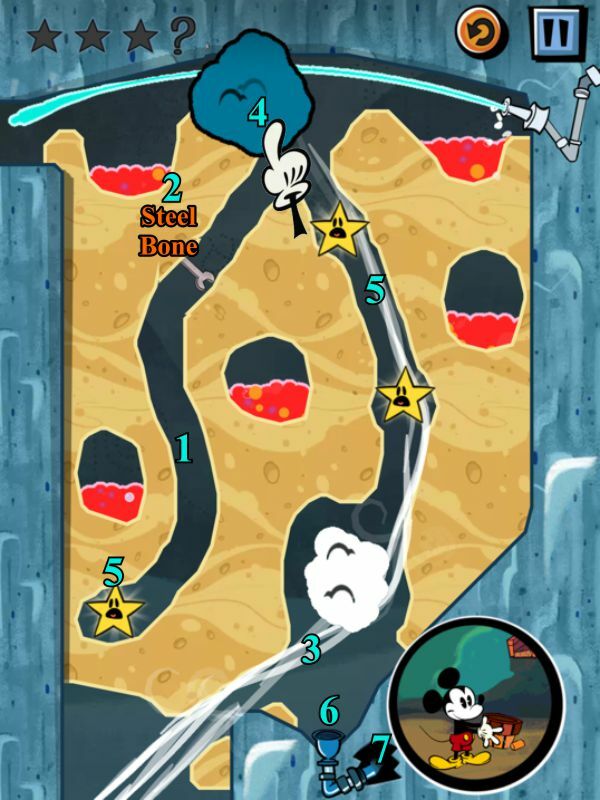 From the Main Menu, scroll all the way to the Where's My Water download, pull the screen and hold it until you see on of Mickey's shoe, and tap on it for No Shirt, No Shoes, No Service. On the Pluto's Collectibles screen, scroll all the way to the bottom and hold it so you can tap on the hotdog for the Hot Digity Dog level. 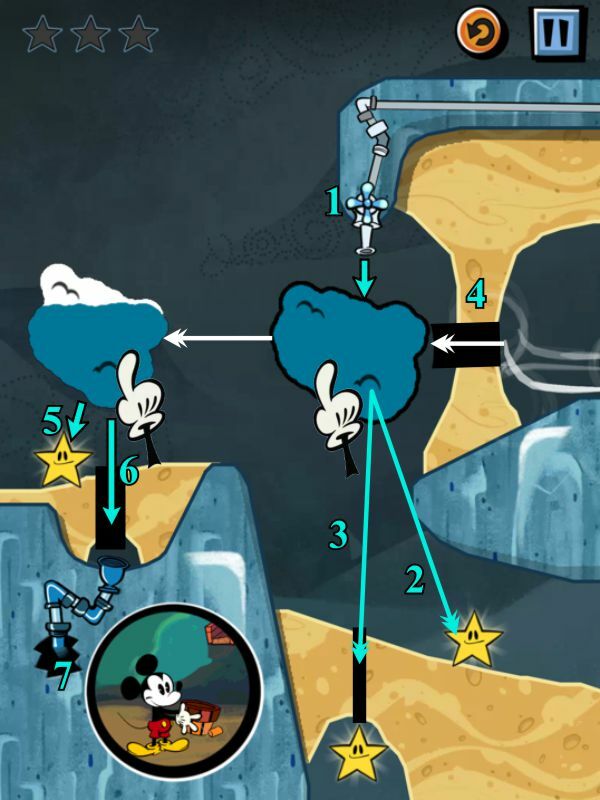 Also on Pluto's Collectibles screen, select Mickey's shorts and then tap on the pair of shorts on the explanation screen to play the Mickey's Shorts level. I think you just came up with the next game title: Where's My Money? At least the series isn't riddled with in-app purchases and other traps.